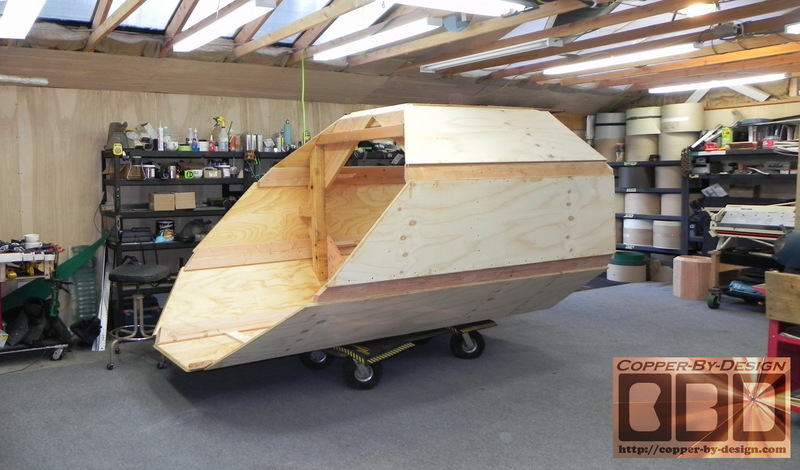 Most of the work I do is custom, but here's another project I've done that shows the unique diversity and innovative ideas of what I can do to solve your needs and desires. 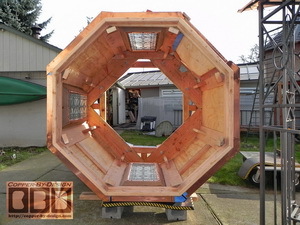 This is also good advice for your local Contractor to do if you are not within our area of the Great Northwest and don't want to pay for a crate and truck freight on such a large project. 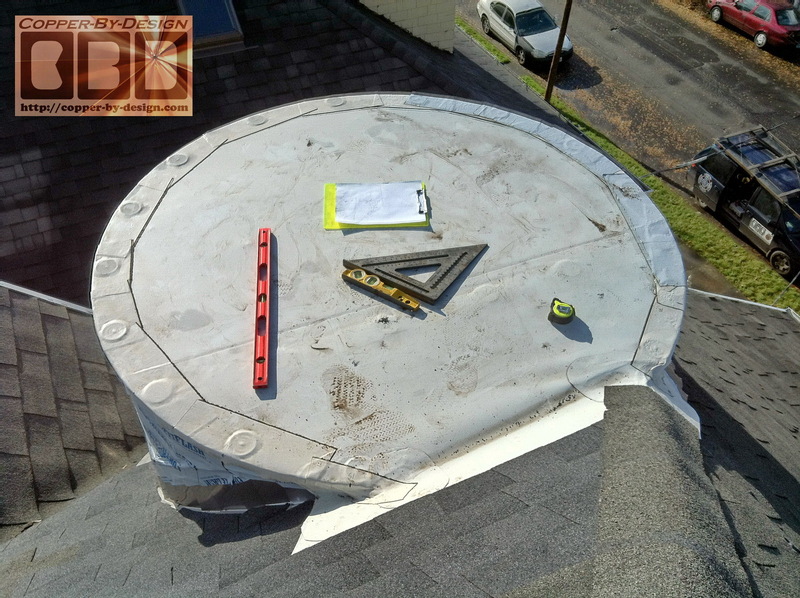 Although, chances are it would not be any cheaper, if you can find a Contractor willing to do the quality of what I would do for you. Justin Brown and Helen Umberger have been our friends since the mid 90's. 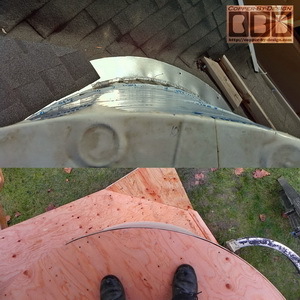 I had replaced gutters on a their last house back in. 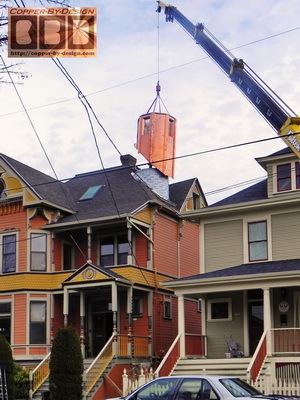 Justin suffered a plane crash and was paralyzed from the waist down, so they needed to install an elevator in this classic original 4 story farm house for him to get around better, but that work left this odd unsightly protrusion sticking up through the roof near the front of their home. 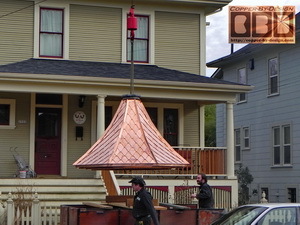 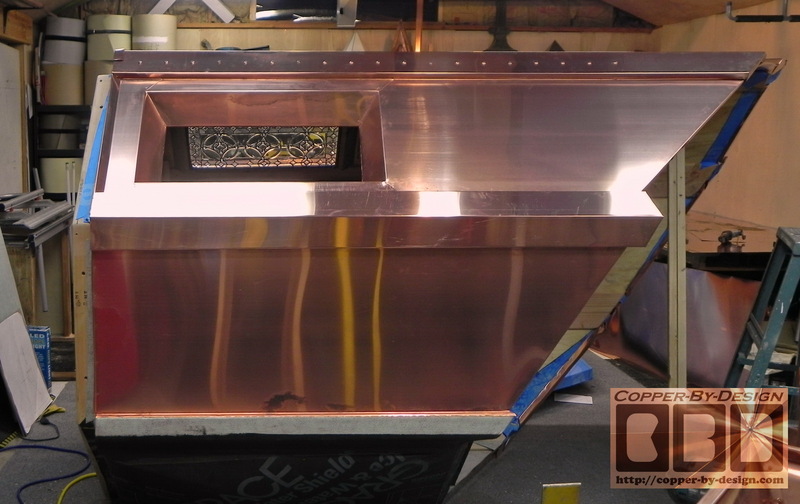 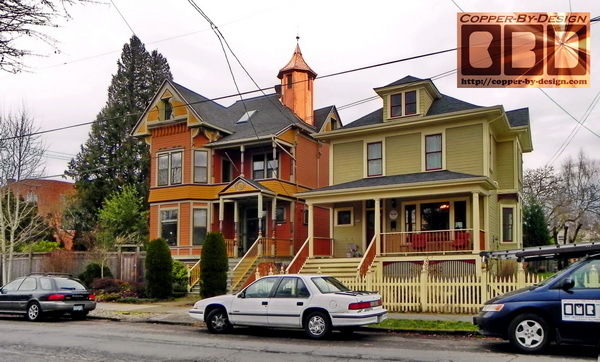 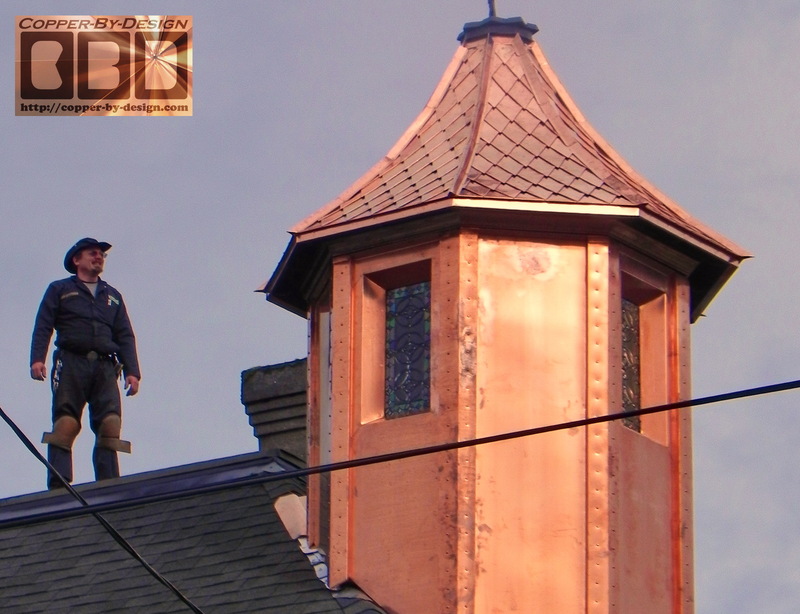 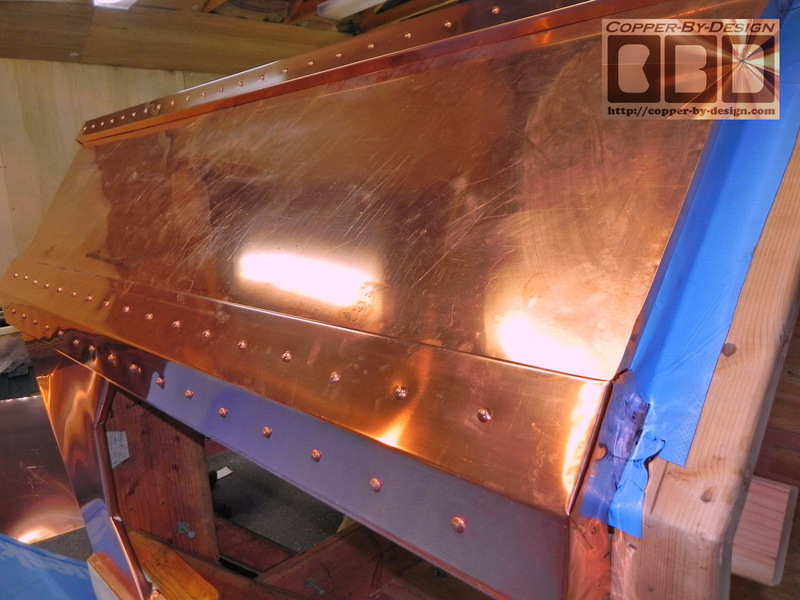 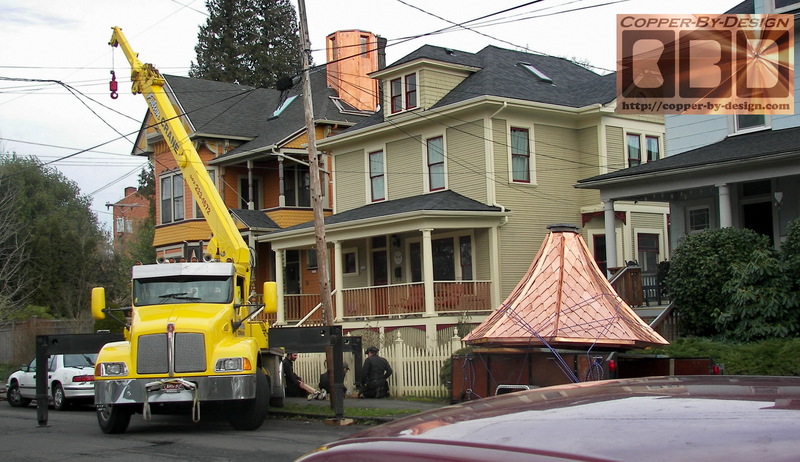 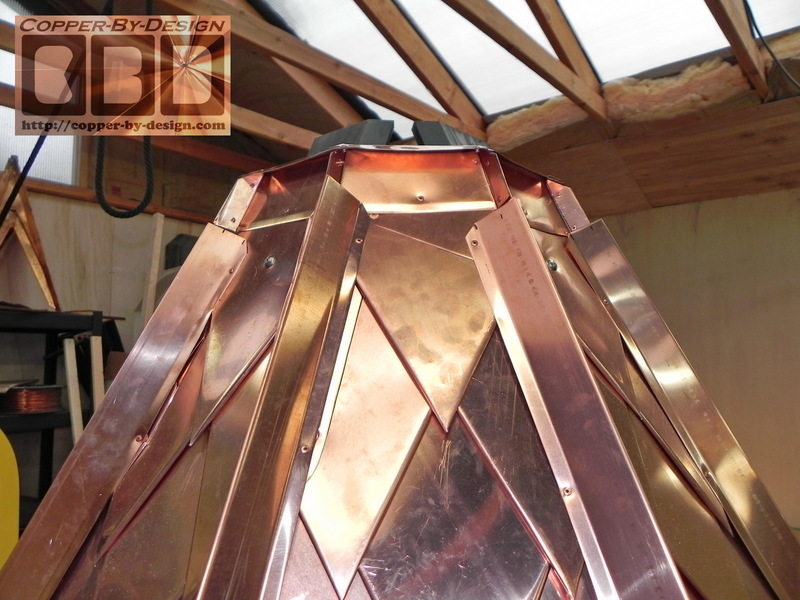 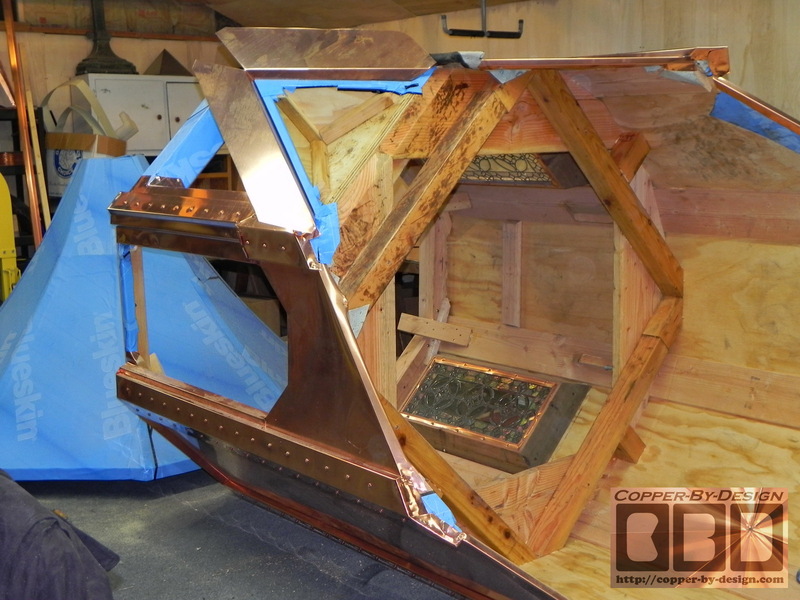 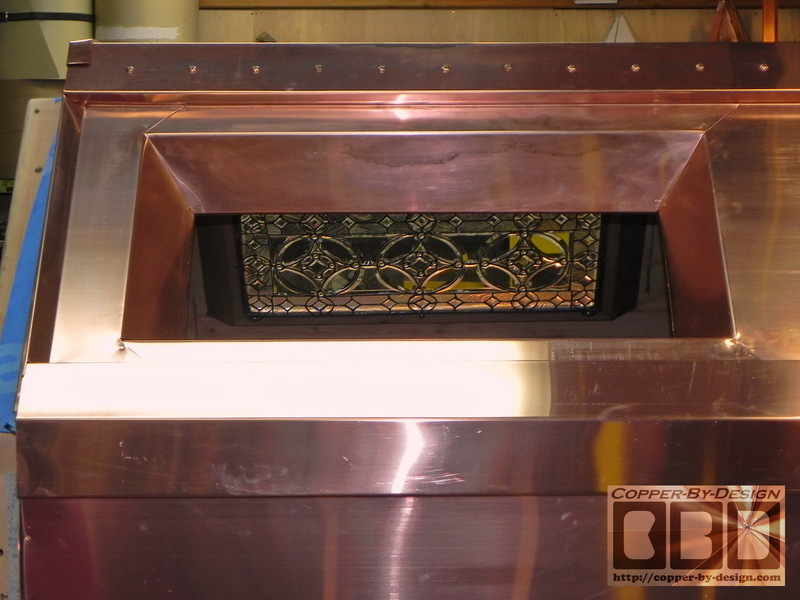 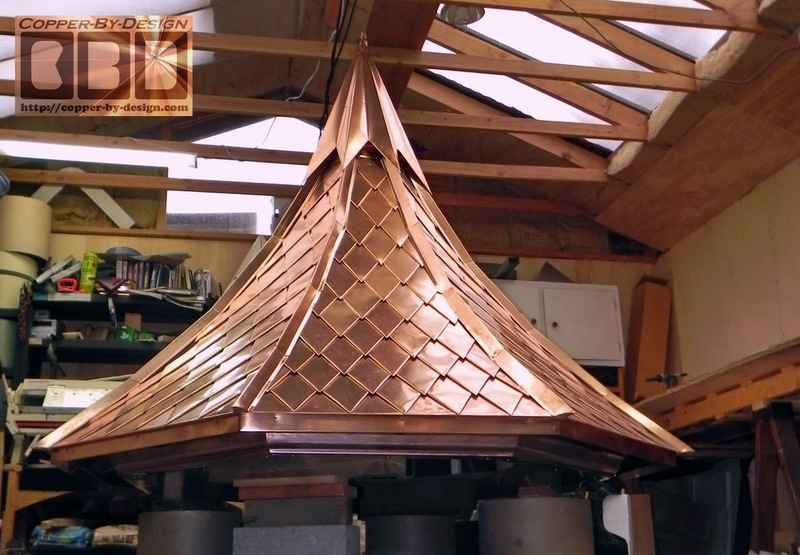 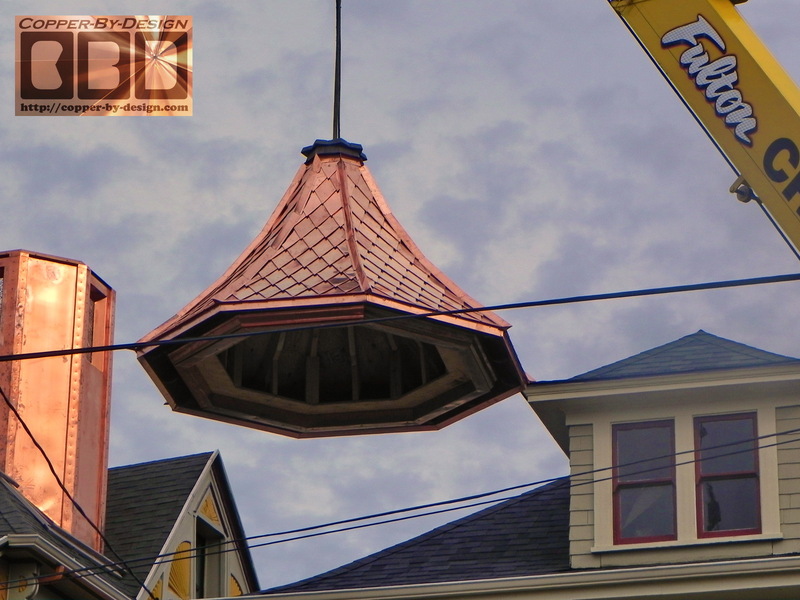 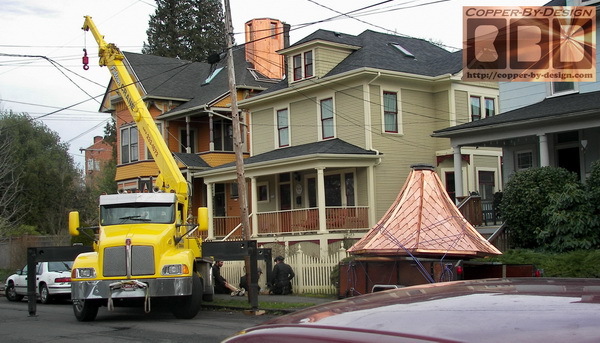 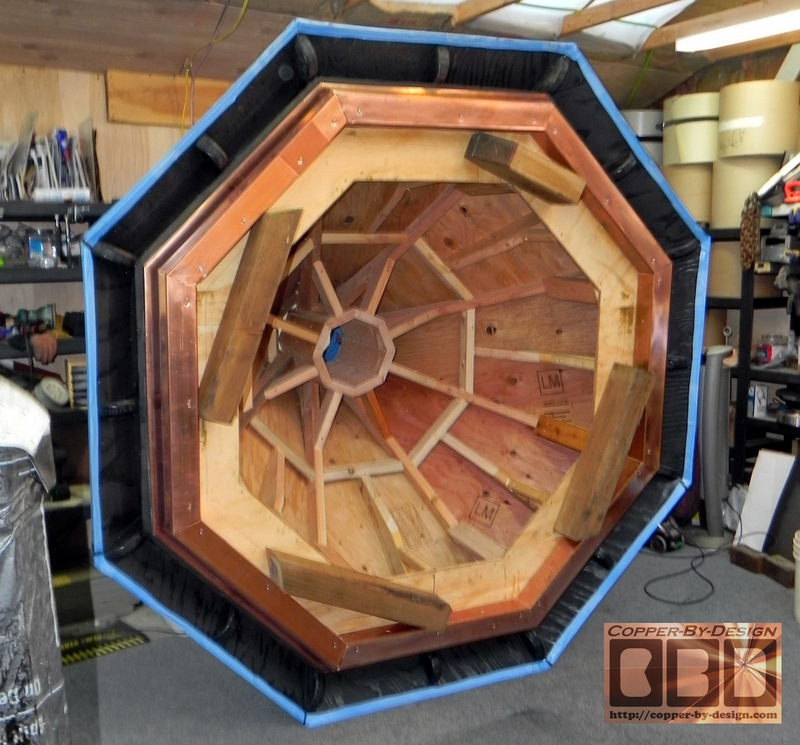 We carefully explore options and worked out the details before they contracted with me again to build them a custom turret to cover this shaft as tastefully as possible and completely covered with copper. 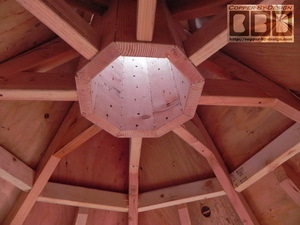 I had to measure and diagram the roof/shaft details to be able to recreate their roof at my shop. Remember you can click on each of these photos to see them much larger. 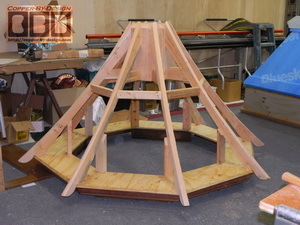 As you see here I had to build this sturdy stand for the turret to make sure the angles would be just right and hold 1,000# on it with the wood structure and 2 people's weight. 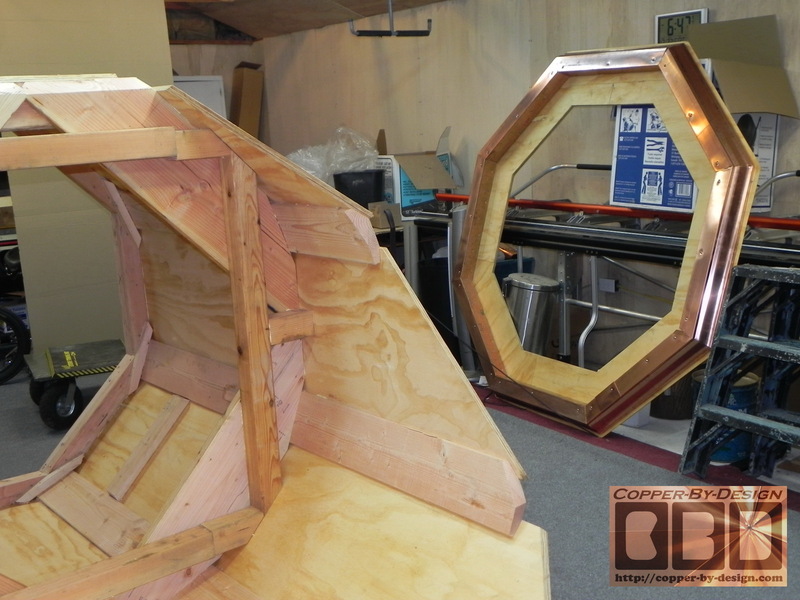 I had to make sure every detail was the same and these were some tricky angles. This took twice as long as I imagined. 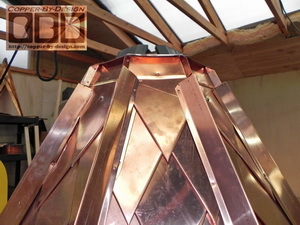 Here's a couple comparison shots of their roof and my stand. 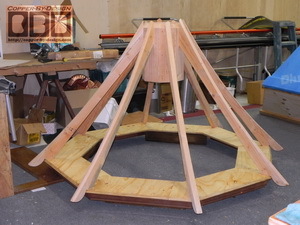 I could now begin to build the turret over the stand I had made. 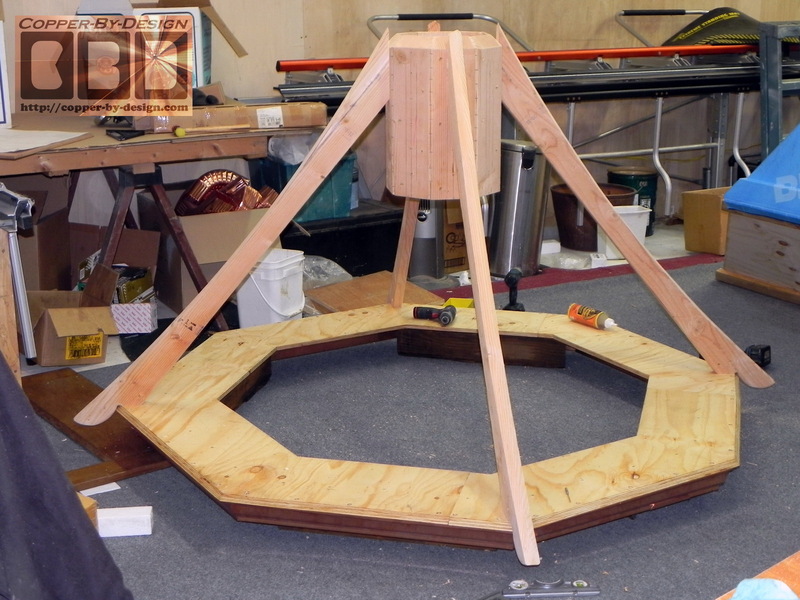 I needed to make this base frame that would support the weight of this turret, which would be around 1,500#. 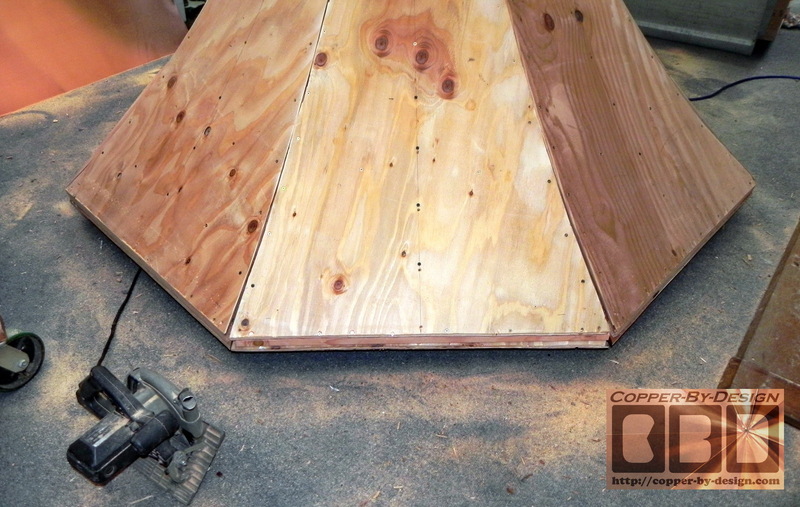 I used 4x4 under these 2x12 boards, which I glued and screwed together for maximum strength. I could hardly wait to get to working on the roof, but I need to be patient and get this lower portion finished first, before I was able to add the crown molding, which will be the base for the roof structure. I angle cut 8 of these 2x8 boards at 22.5 degrees for the corner boards to attach this 3/4" ACX plywood onto. 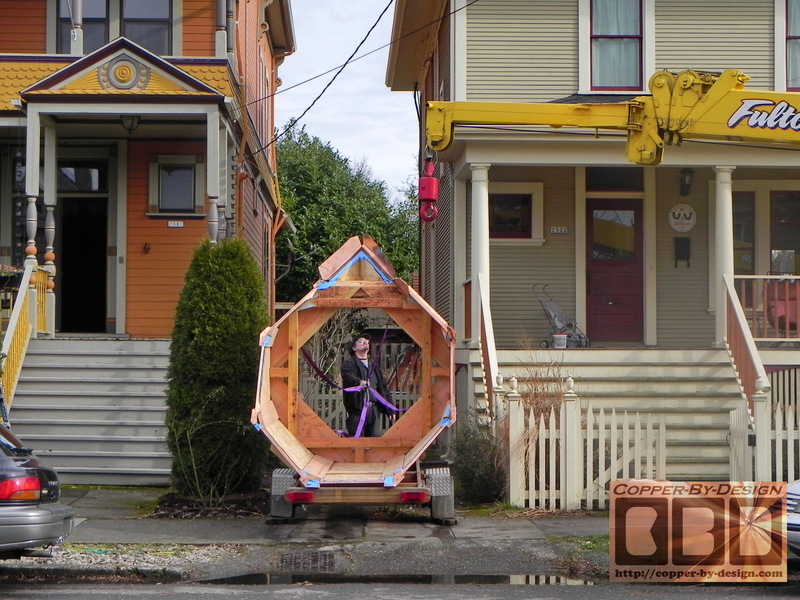 It is now 5' 10" wide. 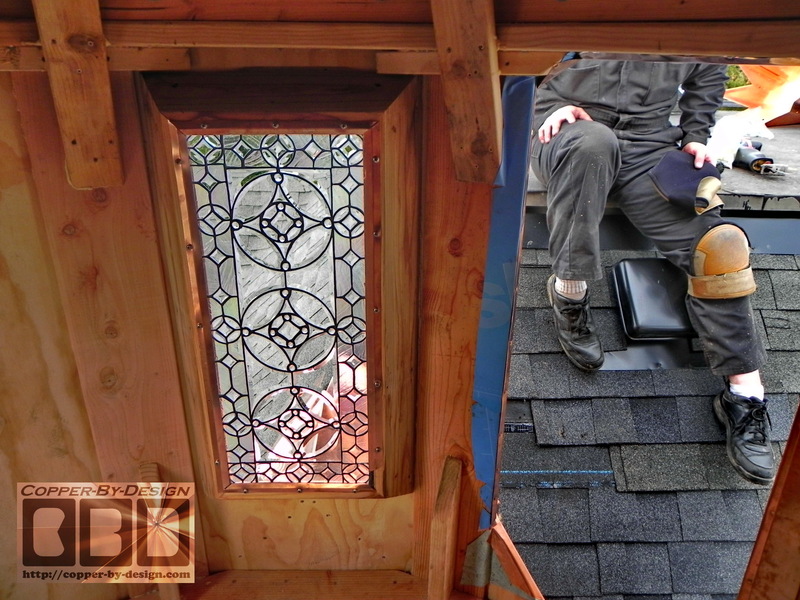 It's funny how my work seems to offend so many Builders, compelling them to rip on my work and vehemently advise you to not do business with me. 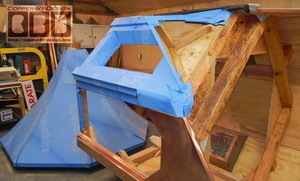 As you see my woodwork is near cabinet quality workmanship that far exceeds normal house construction. It's clear my work threatens what they do: crude sloppy workmanship with lower quality parts, yet charging their clients more than I would. 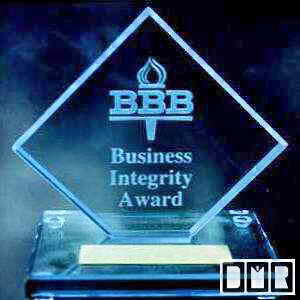 who are really nothing more than slick talking Salesmen). 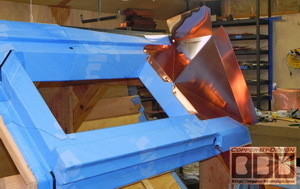 The crown molding was added over this to make it 6' 4" wide. 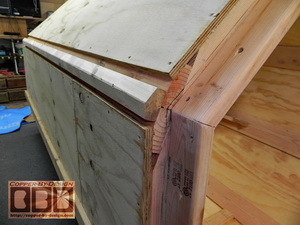 An 8 piece 2x4 frame inside and plywood over this crown molding were added before I could take it off the column section to make sure it would be held perfectly in this shape. 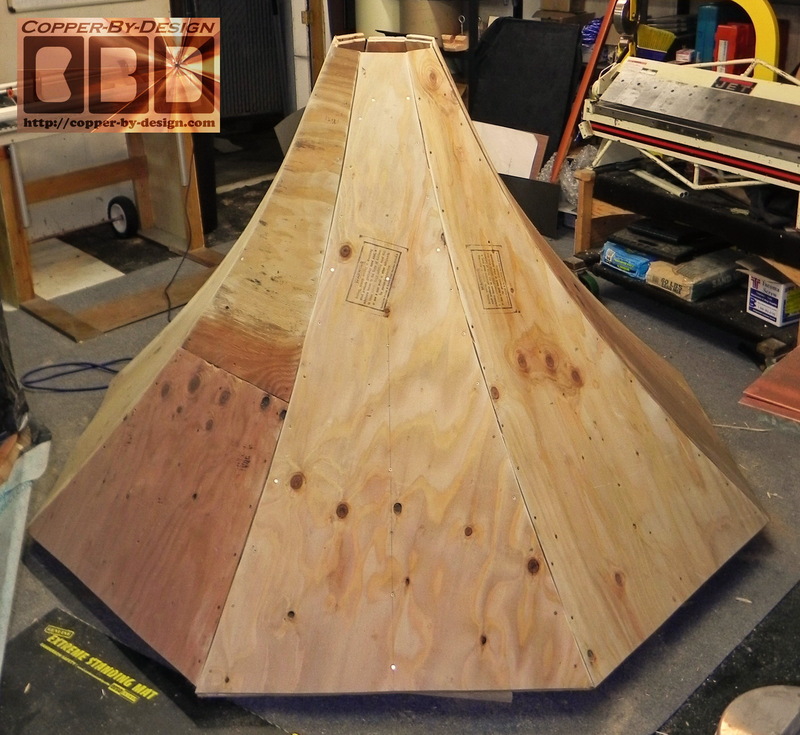 I had to heft up a full sheet of 3/4" plywood over the tower to draw out the shape of the crown molding under it, so I could cut this shape out. 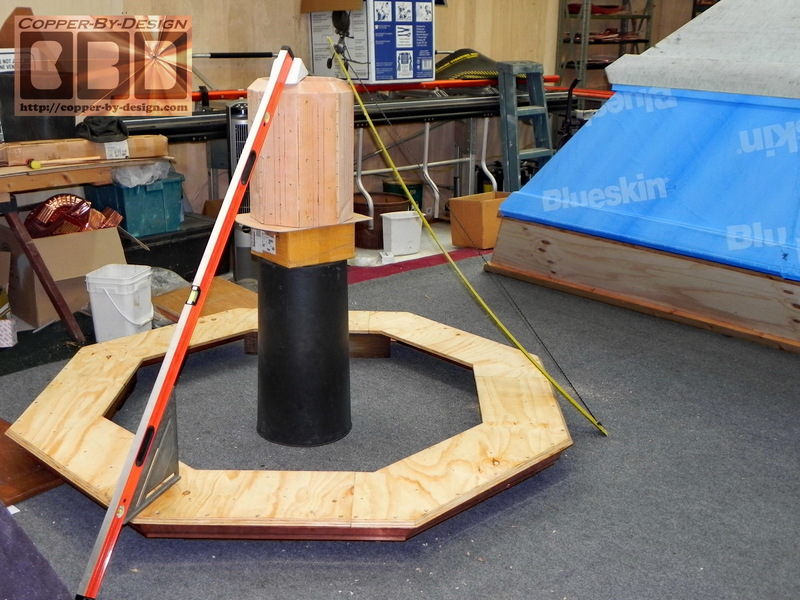 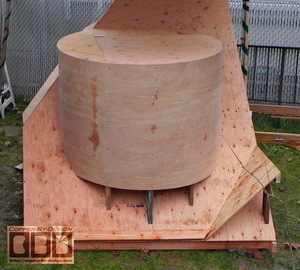 This is what the roof joist will attach onto and add a good deal of strength to this octagon. 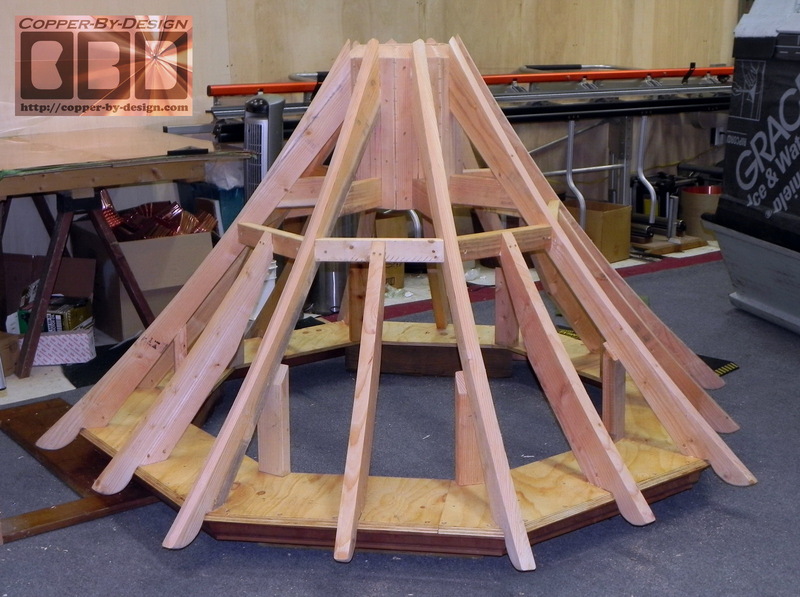 The roof stand was dismantled and put away, since I'm done with it. That only took about an hour to do. 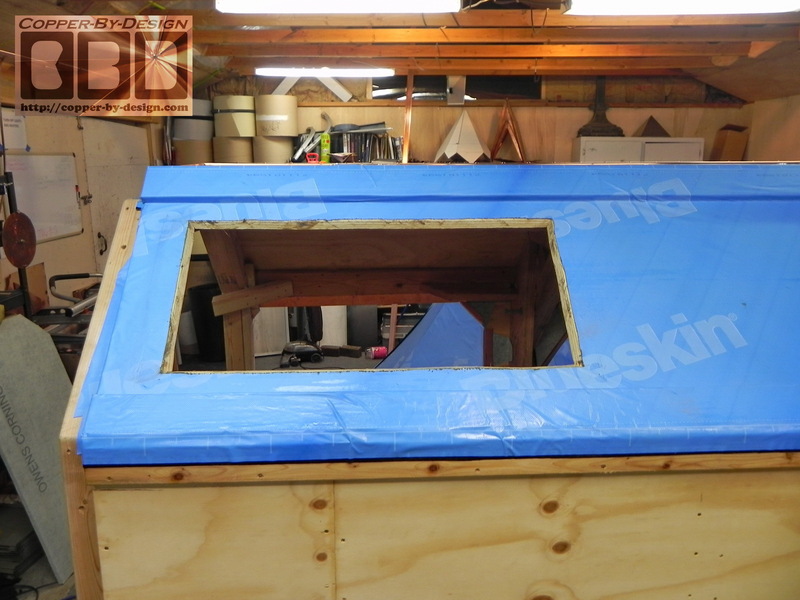 It was time to bring this column section inside our shop to warm it up to attach the Henry's High Temp Water & Ice Shield underlayment called Blueskin. 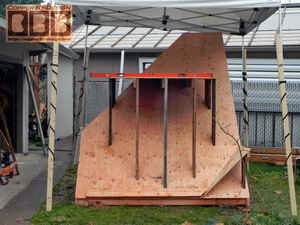 It's too cold outside for it to stick to the plywood. Even inside my shop with a pair of heaters running I still had to use an iron to try to get this to stick to the plywood. It was a very tedious process and still would not stay adhered after all that. I had to spend another $45 for 3 cans of special clear primer to get this to stick to the plywood. It is basically a rubber cement that you can spray over the wood surface. 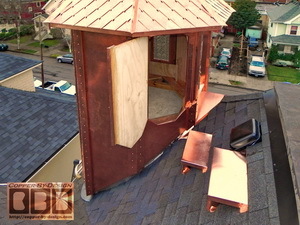 As you can imagine it was quite the adventure getting it up off the roof shaped stand and into the shop. It was plenty sturdy. 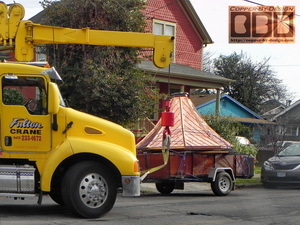 Just heavy. 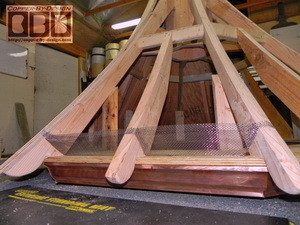 My shop scale only goes to 400#. 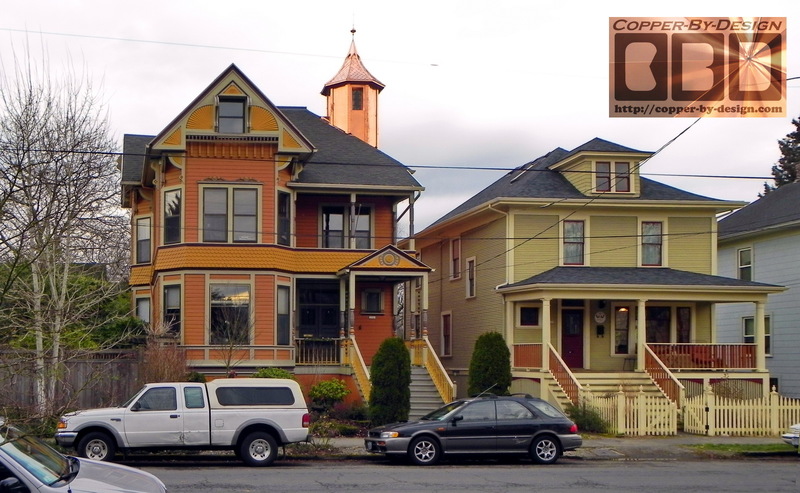 It is close to that, but some where just over it's maximum. My Wife said this looks like a Star Trek space shuttle laying on it's side like this. 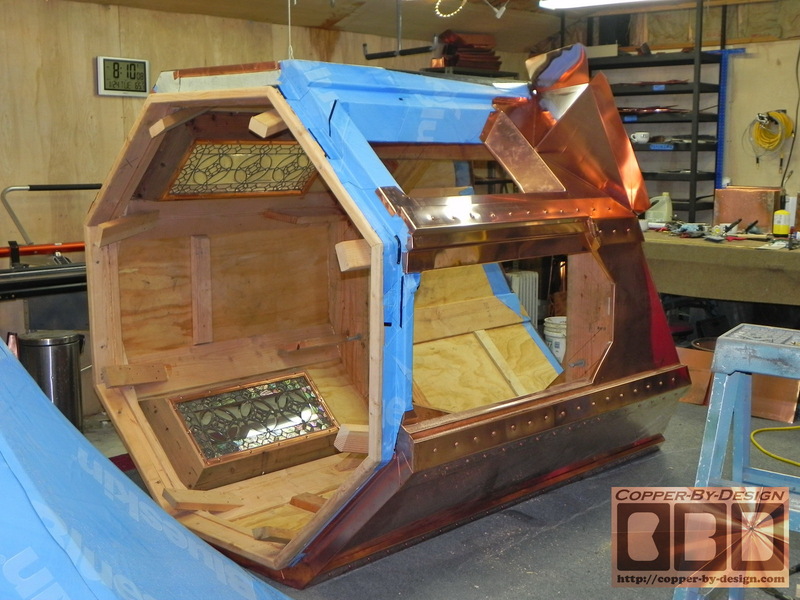 The door, corner trim, W&I, and copper will be adding a little over 300# to this column, so I'll expect it to weigh around 800# by the time it's ready to be delivered. 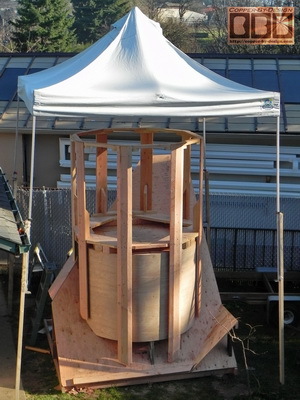 Then there is the 7.5' tall roof structure to place over this. I angle cut 8 of these 2x3 boards at 22.5 degrees for the corner boards to attach to in between the plywood. 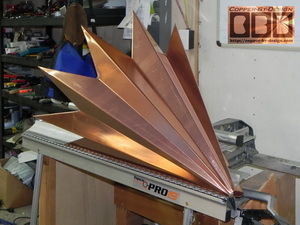 It is now a full 6' wide. 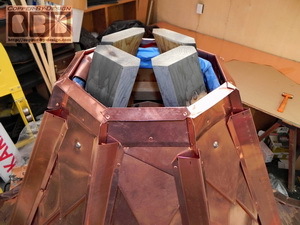 This shows the door I made for the back of this column to access the inside of this turret from the flat roof near by, so they can change the lights when needed. 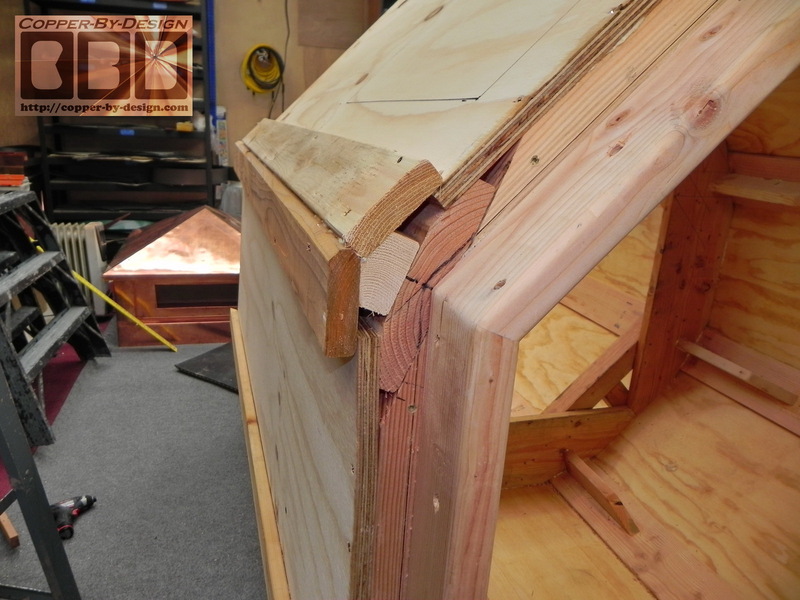 I am covering all this wood with Water & Ice Shield as a vapor barrier from the condensation that may occur behind the copper that will cover this. 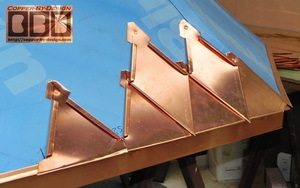 I tried 3 different types. 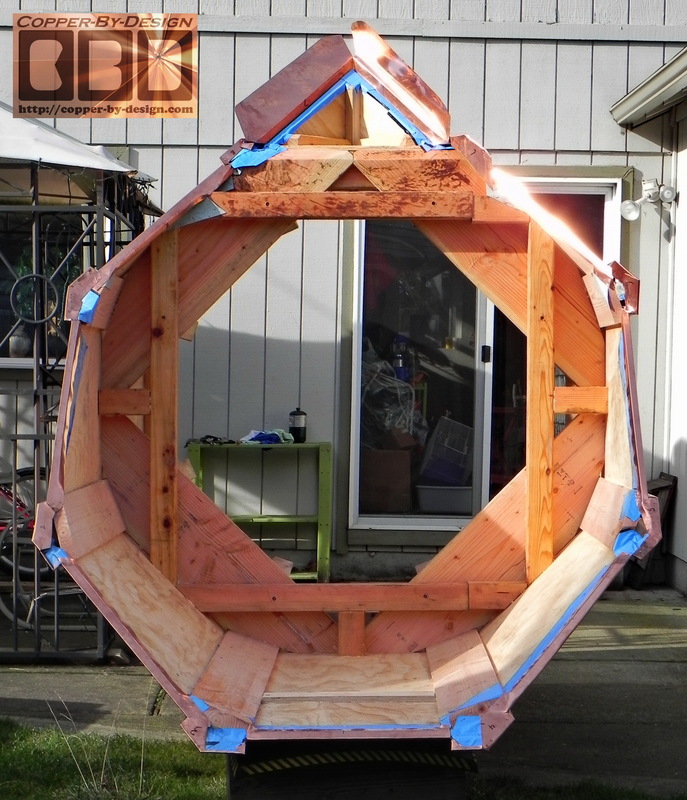 I had some black Grace W&I left over from a different project that I used on the side that will never get direct Sunlight, but it was so bad in comparison I wound up stripping it off. 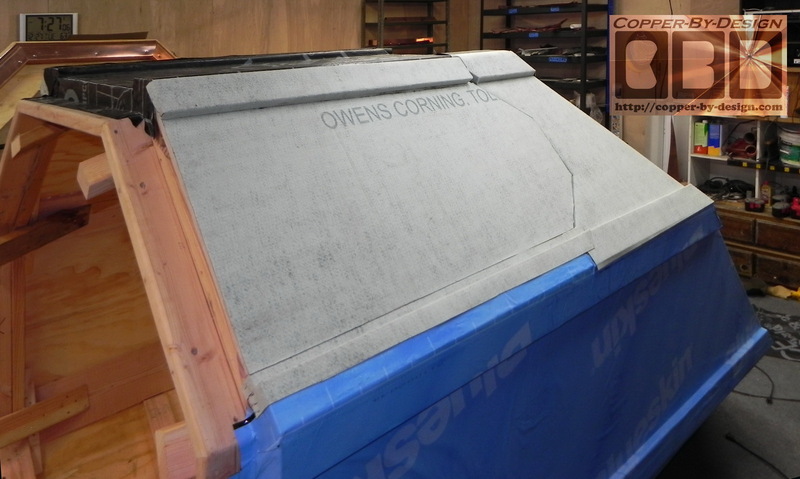 I really liked the Owns Corning W&I, but I could not find any supplier in town who had it in stock, so most of this was covered in the Henry's Blueskin W&I shield underlayment. 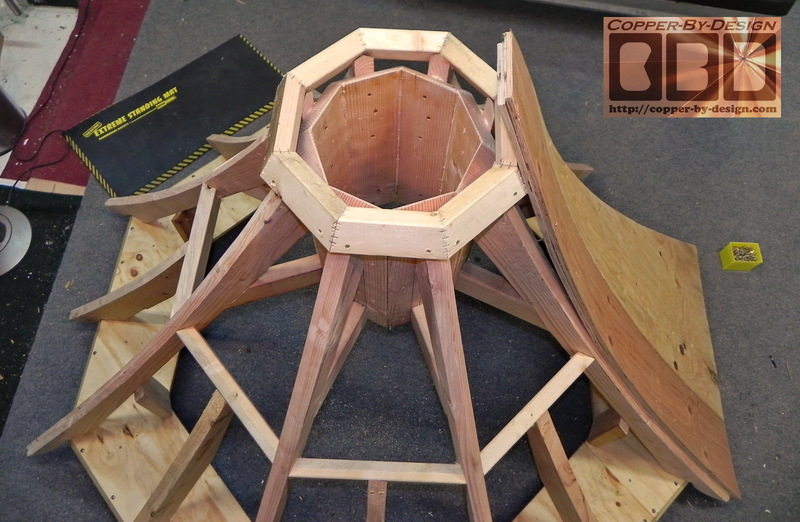 I began to work on the roof structure. 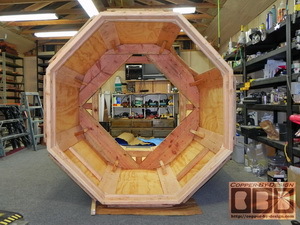 I first had to find the right height and perfect center for the middle column I had made. 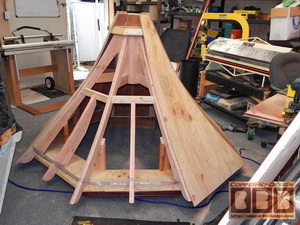 Then once I have that all set I needed to make some careful calculations to determine the lengths, angles, and curvatures this would need for this concave roof design to extend out enough for a roof vent under the eaves. It takes a bit to visualize all this to make it work right. 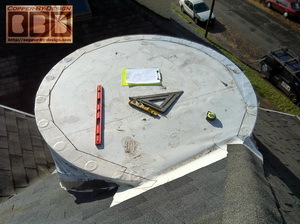 I designed this to start with a 12/12 pitch at the bottom edge and graduate to a 24/12 at the top of this part. 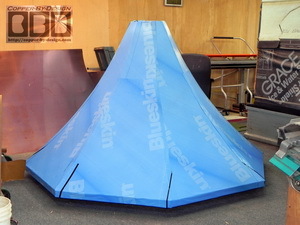 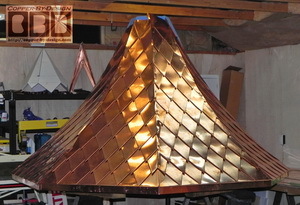 I will be making a roof peak cap that will have a 30/12 pitch or more. 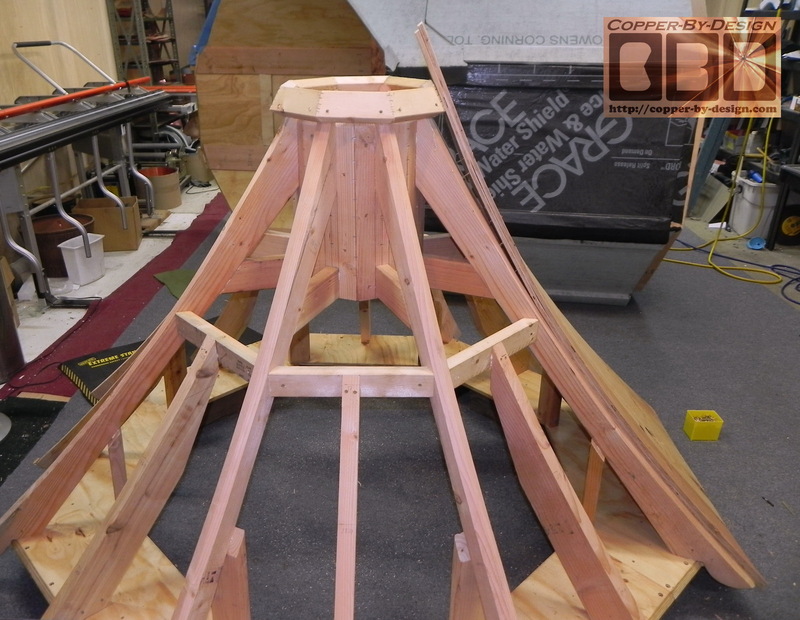 With just these first 4 supports (above right) it can already handle over 1,000# on it. 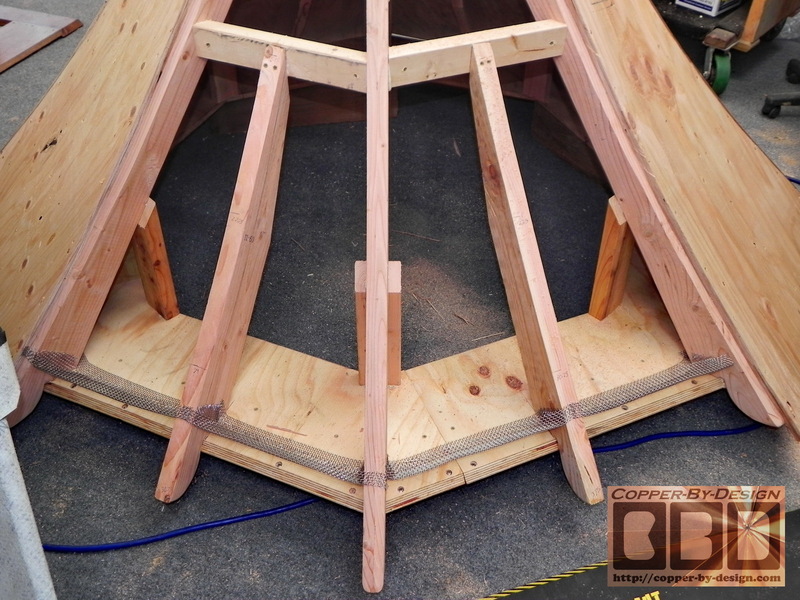 Then all 8 hip trusses are attached (below left). Even w/o plywood over these it can now hold a ton over the center. 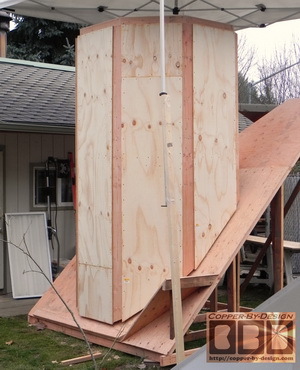 Even if this house were on Mt Hood it would never be subjected to that much snow load, but I figure why not make it as strong as possible? 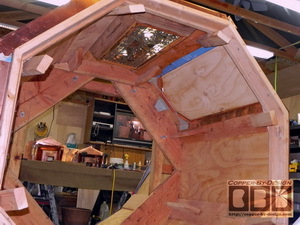 Then another 24 cross braces were added (above right) before the last 8 trusses go in between these hips (below). 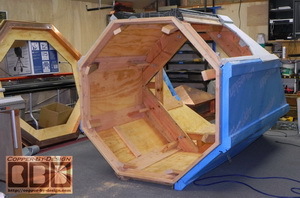 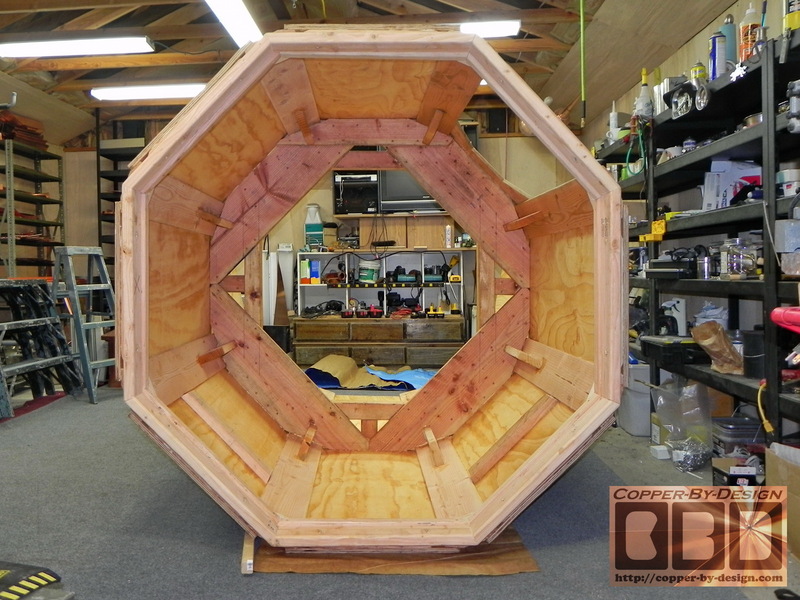 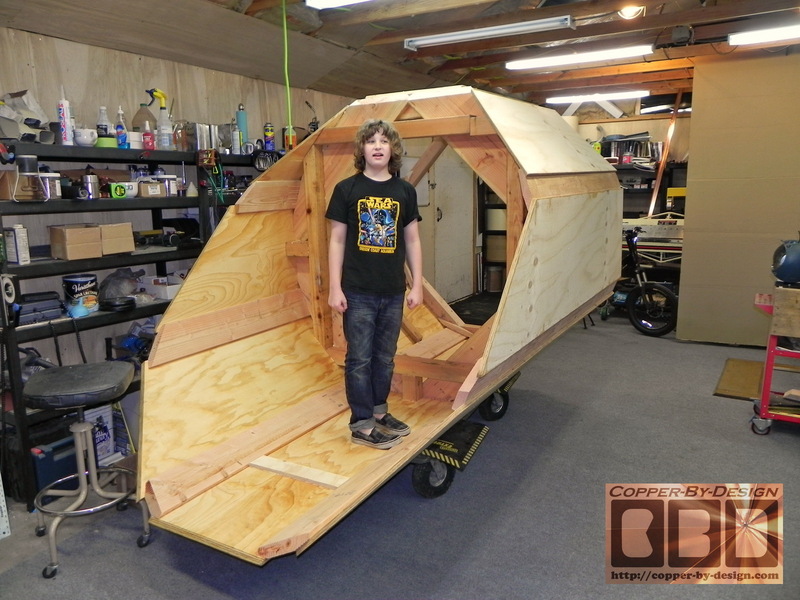 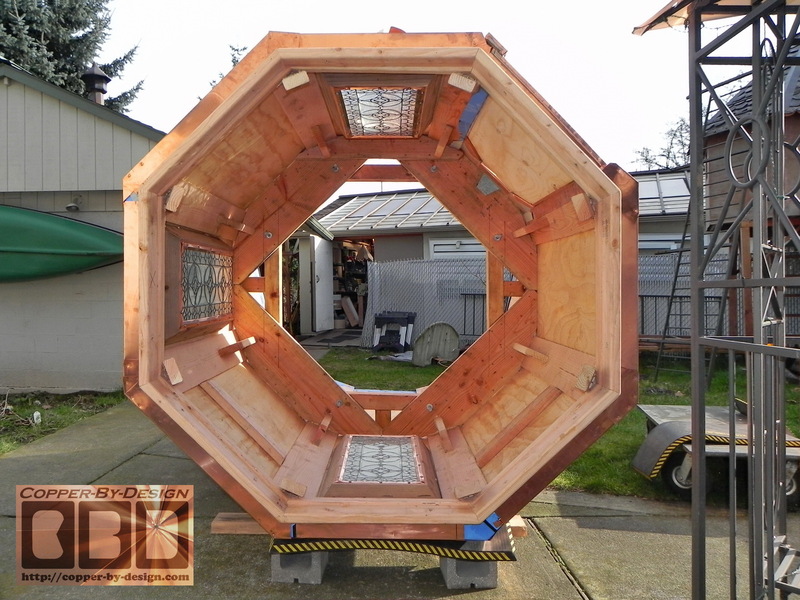 This structure has 16" centers at the widest parts, so it is at least twice as strong as most house construction, besides being assembled with predrilled holes, glue, and screwed together. More like cabinet quality workmanship. After looking at this I felt there was not enough curvature to this slope, so I made another wood ring to push the top out and increase the angle of the plywood there at the top. It now has a 28/12 slope at the top. 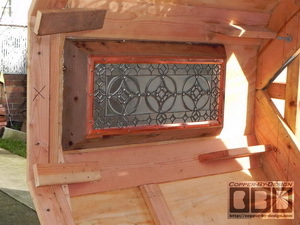 I added some of the stainless steel screen inside the eaves for ventilation before I got too carried away with covering this with plywood. 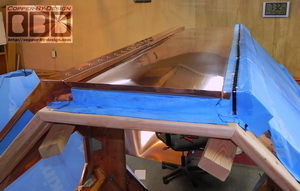 By back setting the screen like this it should be less noticeable from the ground and provide more screen surface, so there is less issue of it getting clogged with dust over the next few decades. 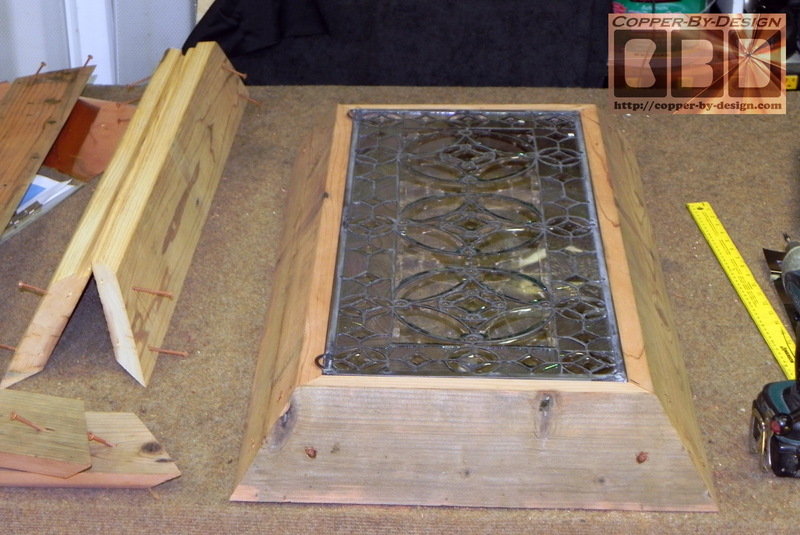 It is not as fine as window screen, but should keep out most bugs. Here is the roof being covered with 2 layers of 3/8" plywood for a 3/4" combined thickness. I decided there still was not enough curvature, so I added another 8 boards to go in between the 2 layers of plywood at the bottom edge lifting the bottom edge to create a little more curve. 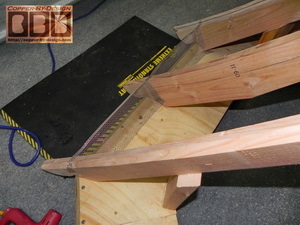 It also helped straighten this horizontal bottom edge. The tension of the curved plywood made it dip between trusses. I then needed to trim the bottom edges to be vertical, before I could cover this whole roof top with the Water & Ice Shield underlayment. I decided paint the eves black before wrapping all this with copper sheet metal. 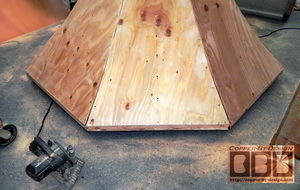 it is a high quality spray paint that cost me over $12 a can. The 4x6 blocks you see under this were just to hole it up off the floor, so the copper crown molding did not get dented. 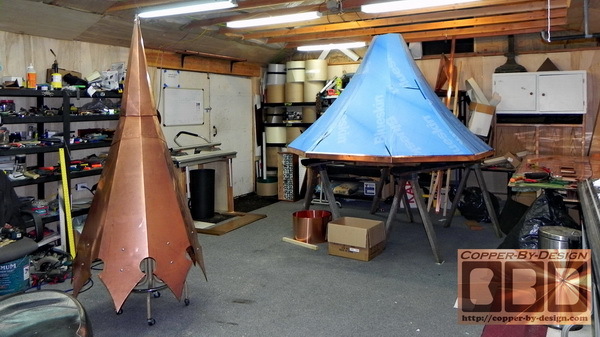 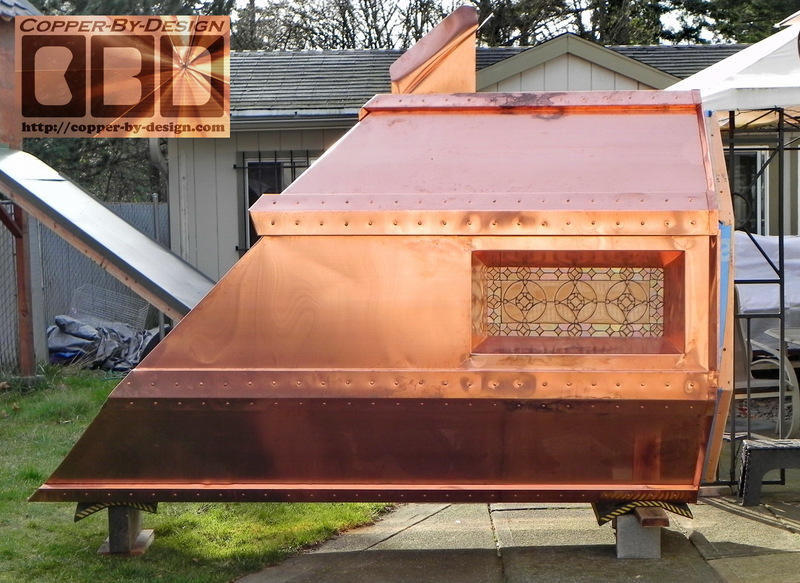 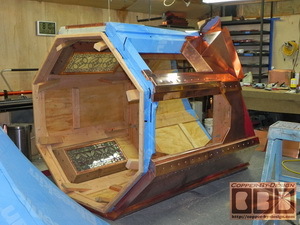 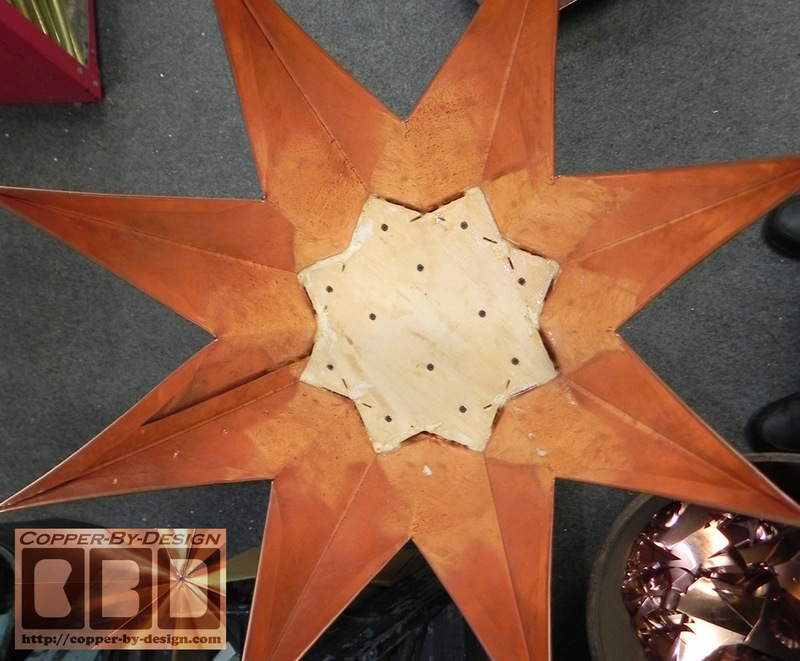 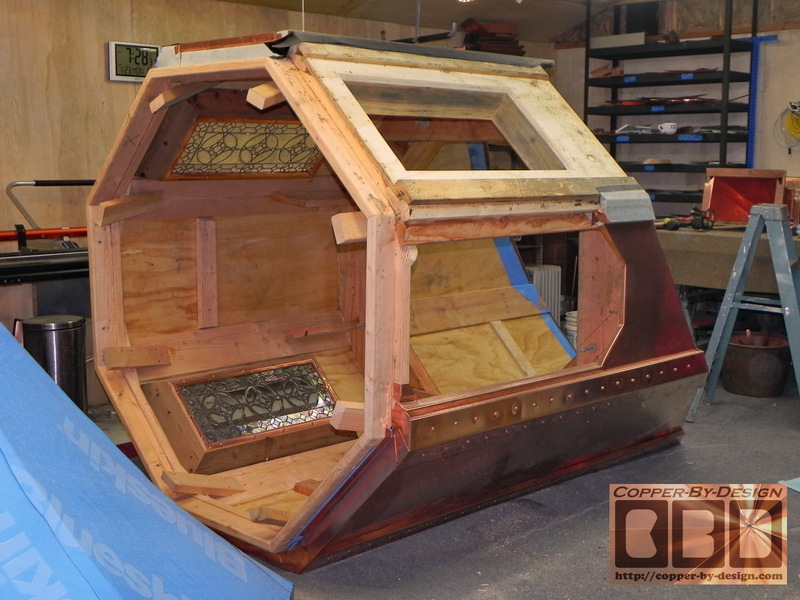 I started to wrapping all this with copper sheet metal and add the large domed rivets for dramatic effect. 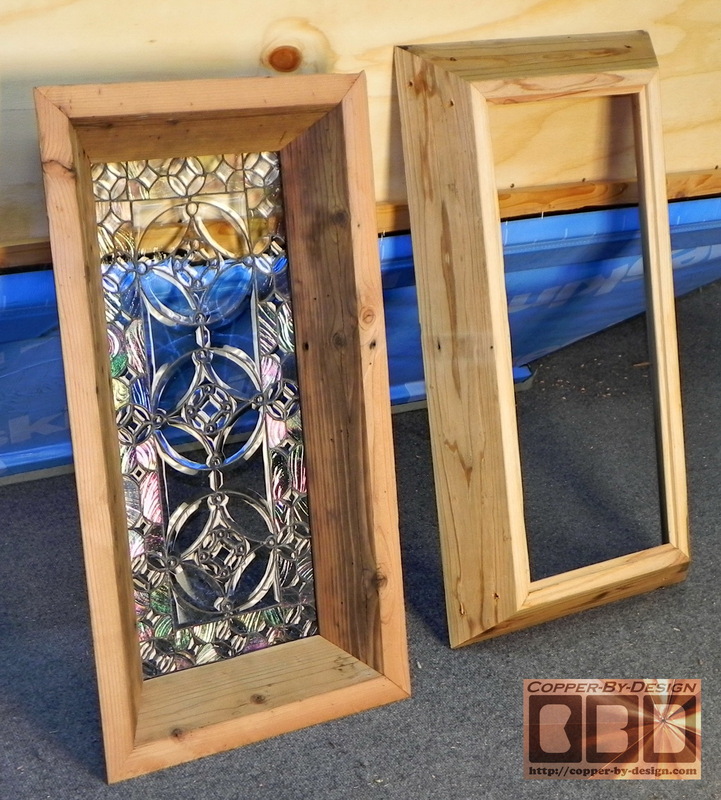 I made 3 sets of angled wood frames to hold these fancy leaded beveled glass windows the client had ordered. 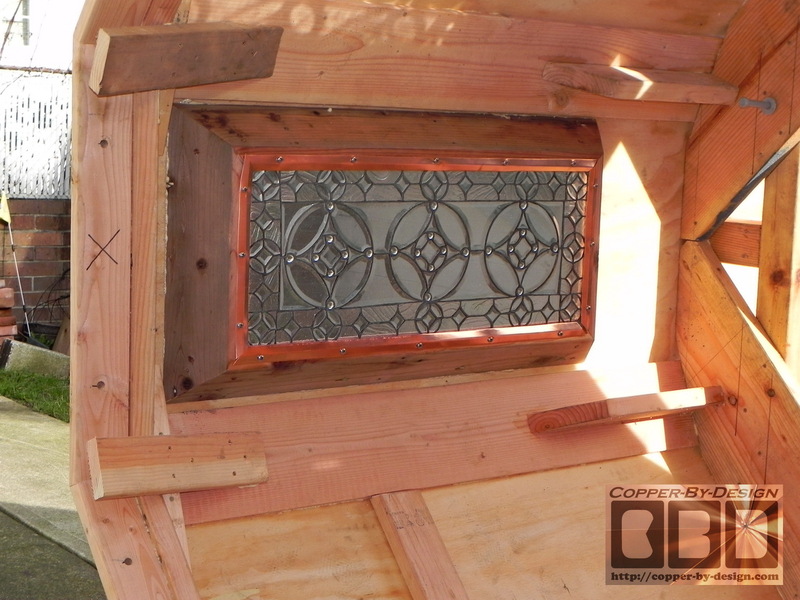 They will deep set these windows about 4" once mounted from inside. The angle is a 35 degree cut on the long ends of the 2x6 redwood I recycled from a deck I had replaced a couple months earlier. 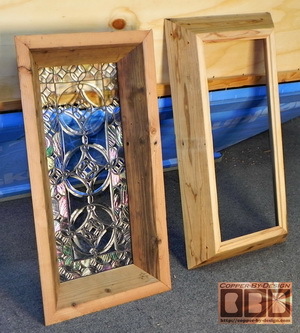 They were sanded down to remove the weathered outer layer of wood and mildew. 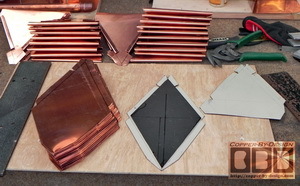 Then glued and screwed together. 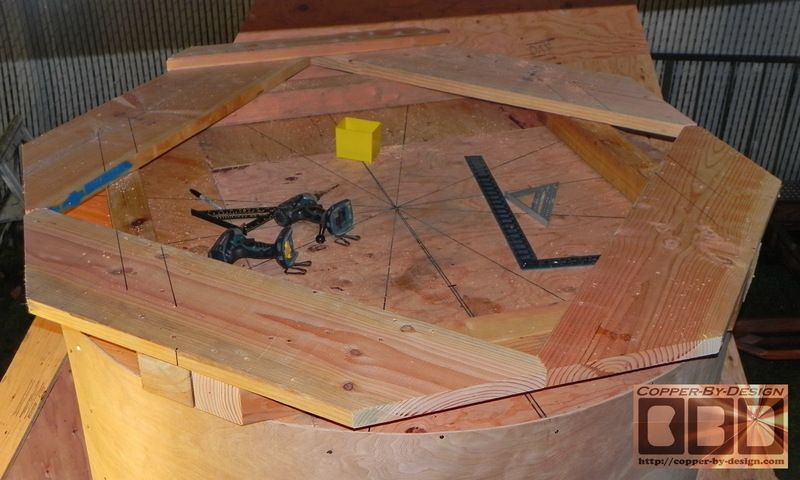 I then needed to angle cut the window holes in the turret. 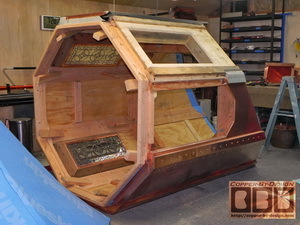 Then glue and screw the frame in behind this. 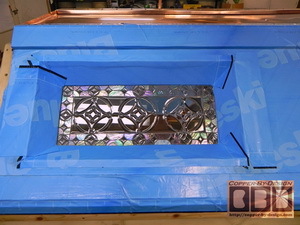 I sanded the edges flush, and wrap it with more Blueskin before I can cover all this with copper sheet metal in these 4 separate pieces. 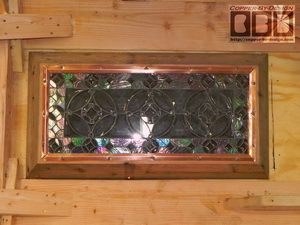 I got this first window in and surrounded with copper like a picture frame. 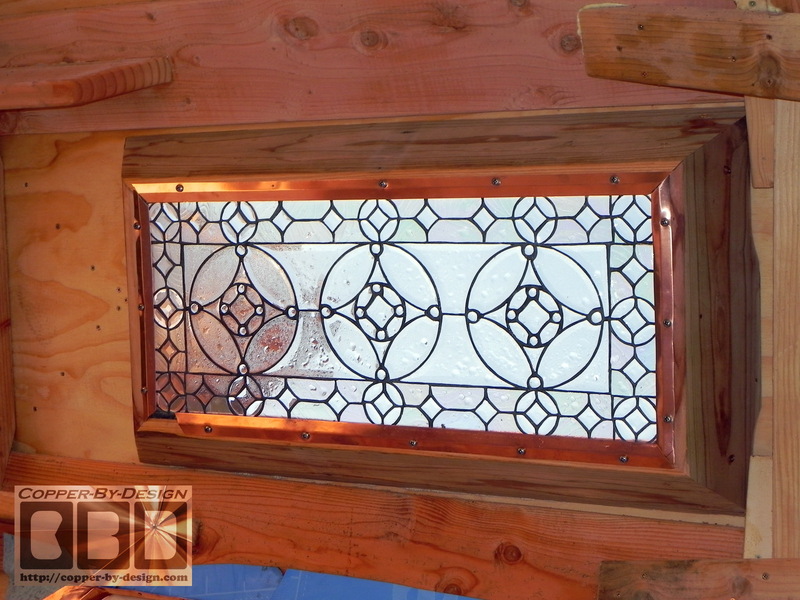 These windows are held in place w/16 SS screws over these copper strips inside. 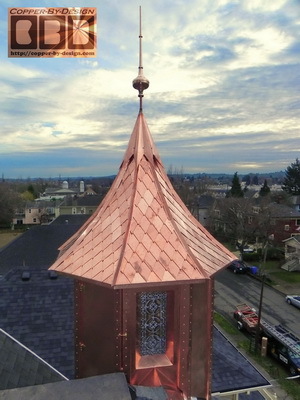 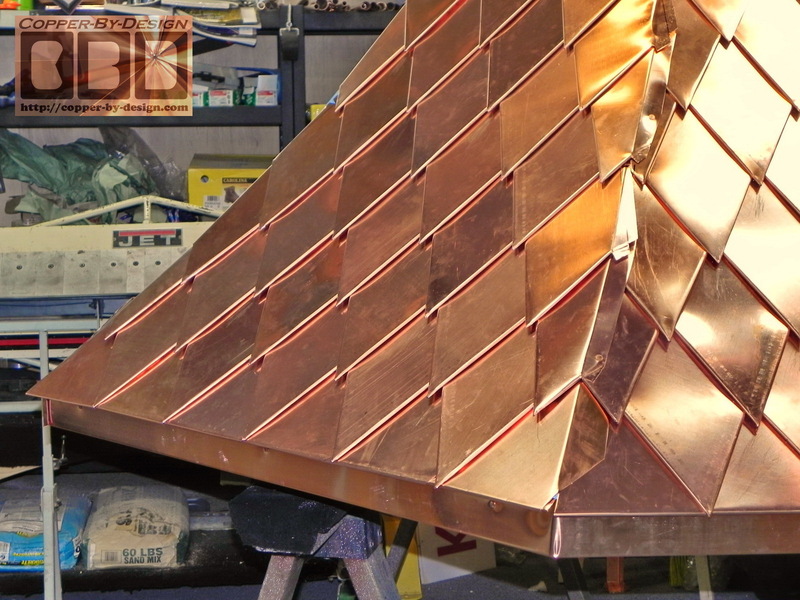 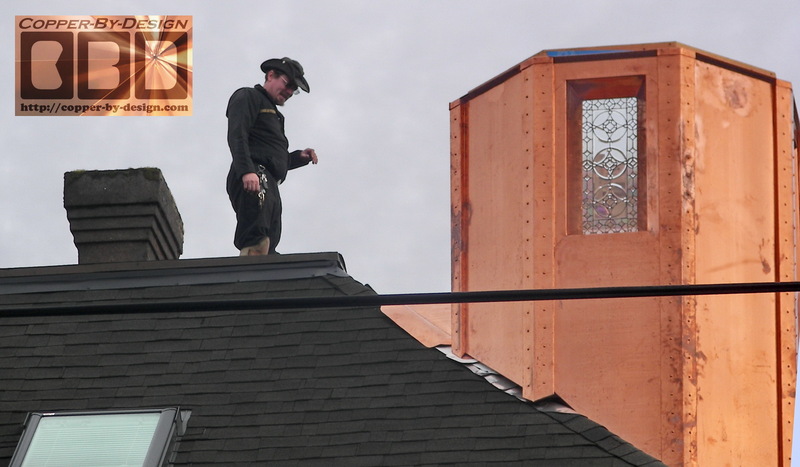 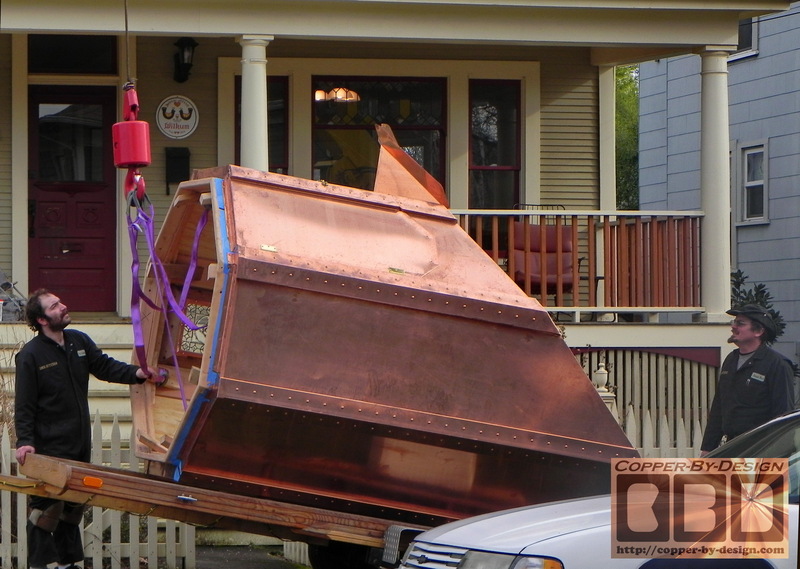 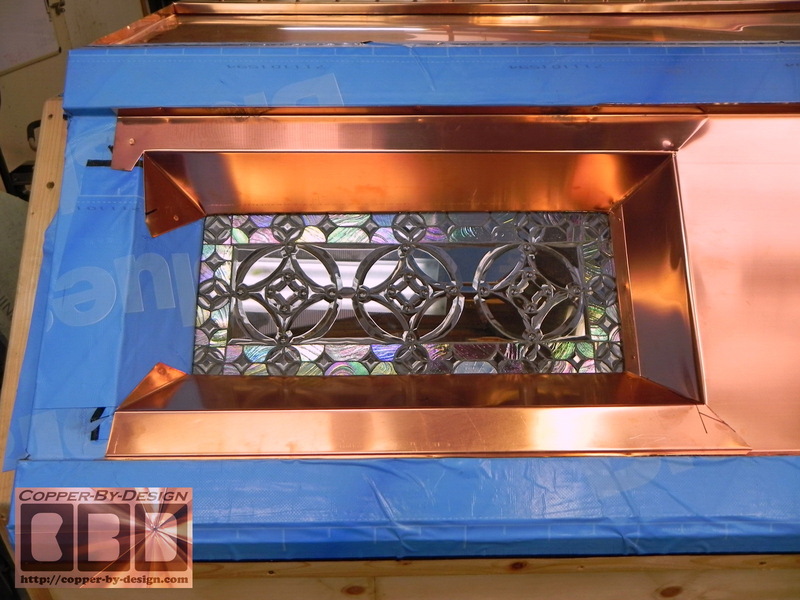 Each piece of copper outside is carefully designed to shed the rain water that may hit the sides in a wind storm. 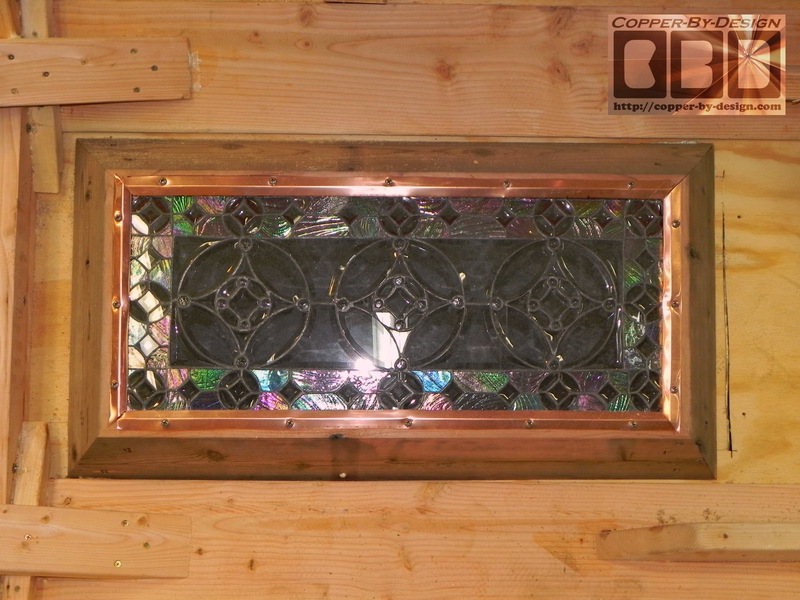 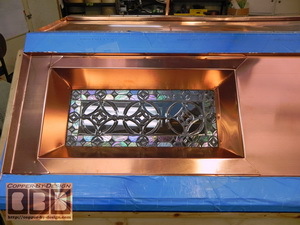 This shows the second window cut, mounted and framed in copper. I now have over 100 sq' of copper on this column on 6 of the larger sides. Before installing the last of 3 windows I decided to strip off the Grace Water & Ice Shield I had used on this one side that will never get direct Sun exposure. 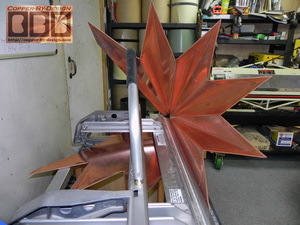 It just was not willing to stick. 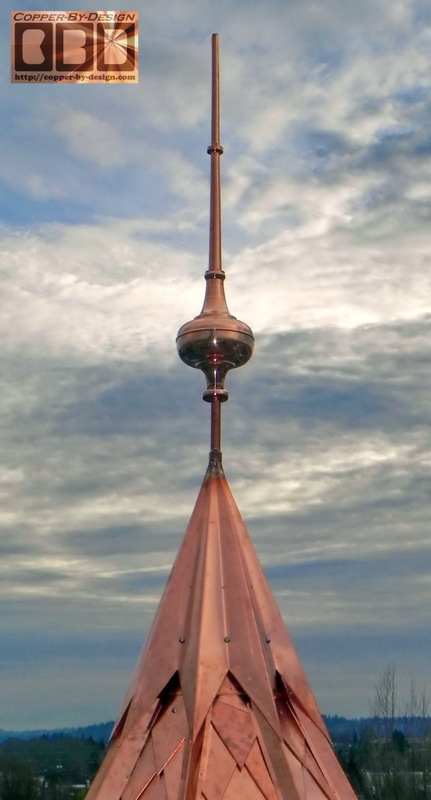 I'll never buy Grace brand again that's for sure. 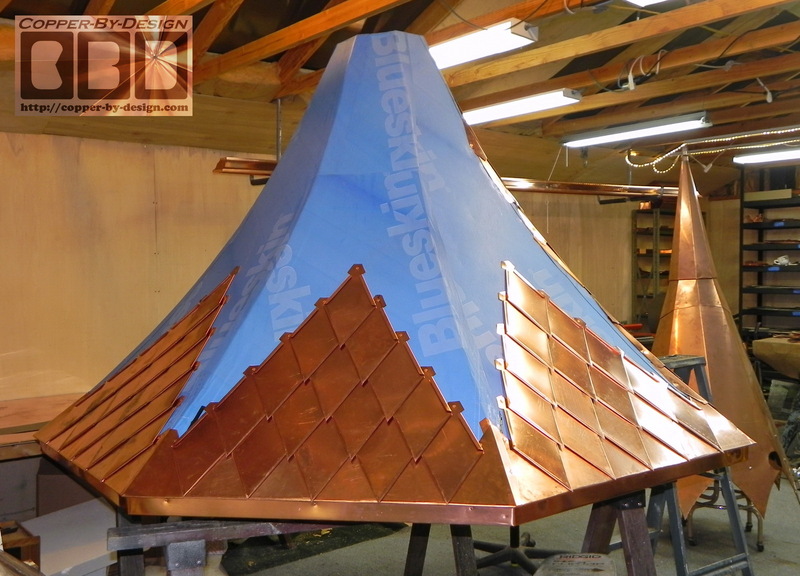 I needed to build a cricket to divert the rainwater and debris off to the sides and cover it with Blueskin before I could finish covering this with copper. 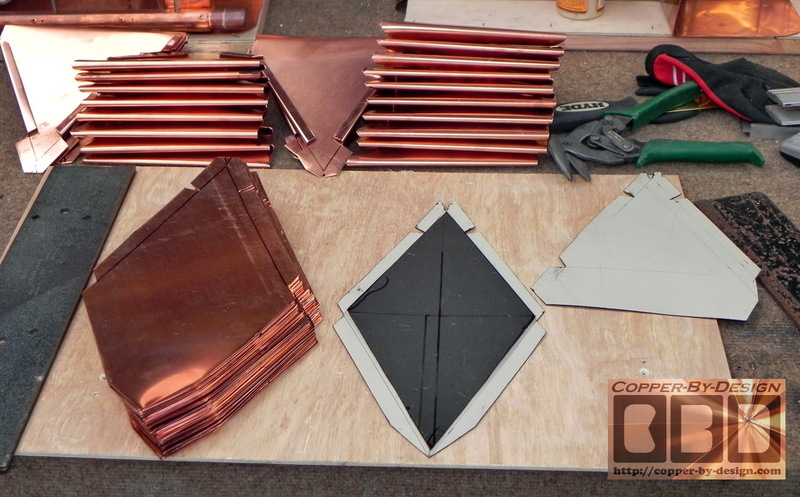 I made this as seamless as possible, but there's no way to cover all these angled parts with one piece, so I have to carefully work from the bottom up with copper pieces, so the upper pieces will overlap the lower pieces to be water tight. 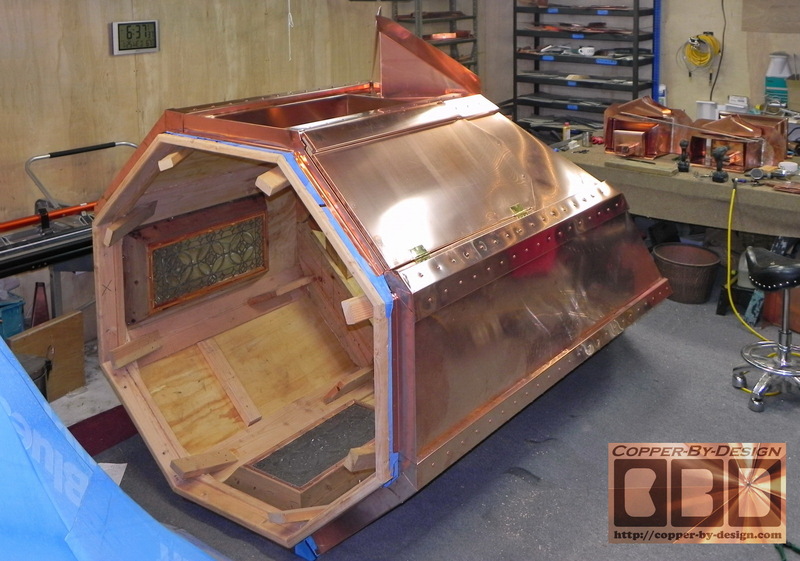 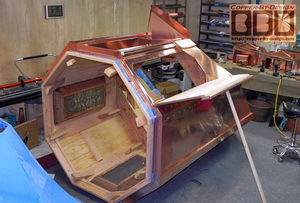 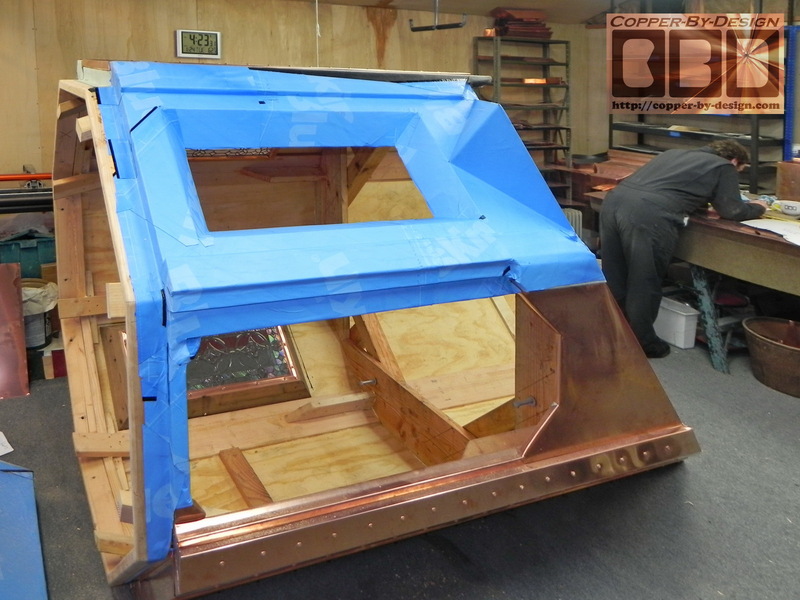 I got the last window mounted and the door covered with copper. 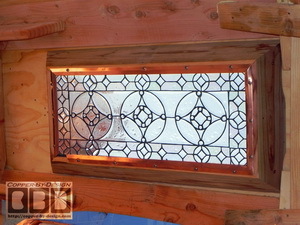 Then mounted the door on brass hinges with stainless steel screws. 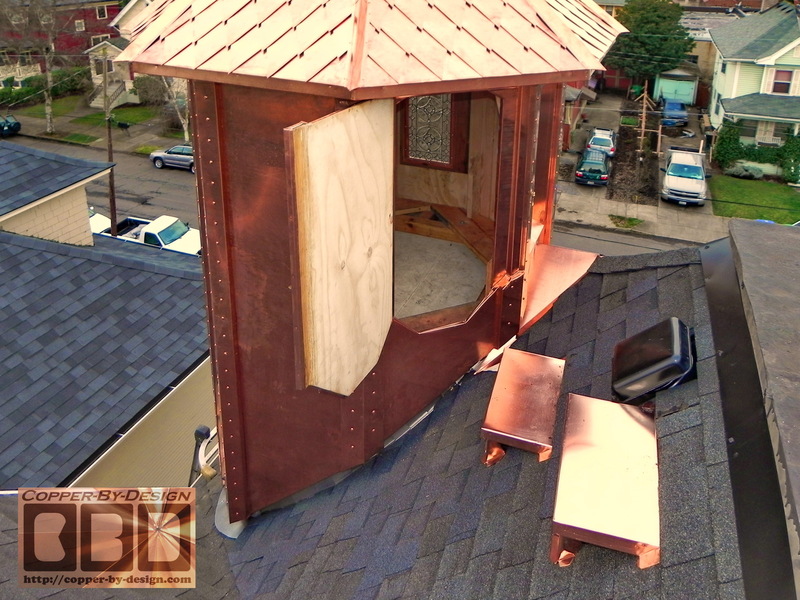 We moved this section outside to make more room in the shop for working on covering the roof with copper, so I was able to get these daylight photos of this section completed. We moved the mid-section outside to make more room for working on the roof. We tried to set this roof structure up on a pair of shorter saw horses, but they collapsed under the weight and smashed Chris's hand, taking him out for the rest of the week. 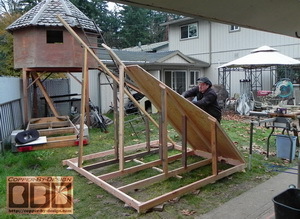 With Tia's help we got this up on a stronger set of padded saw horses. I got this lower rim attached on 4 sides with a single strip of copper 5.5" wide and 148" long. 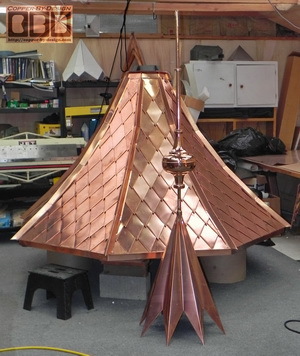 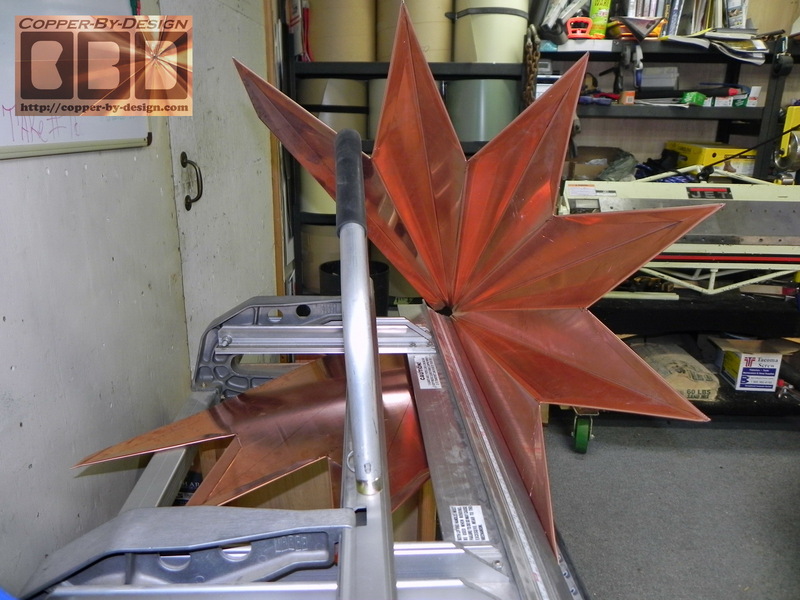 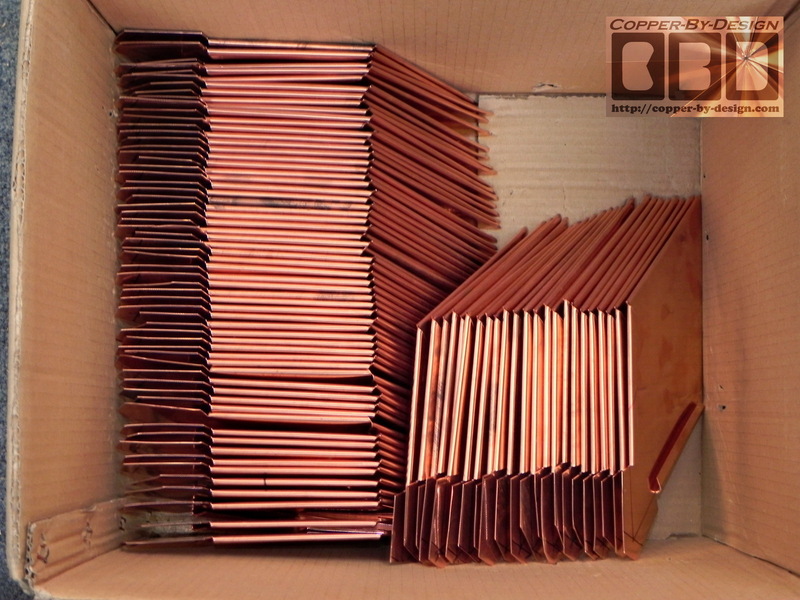 Then I worked for the next day and a half cutting out 156 diamond shaped roofing pieces from small scrap pieces before cutting the big sheets of copper for the rest of these. That set weighed 62# which equals 51.6 sq' of copper to cover about 30 sq' of this roof surface, but I'm going to need 3X that many pieces before I'm done. 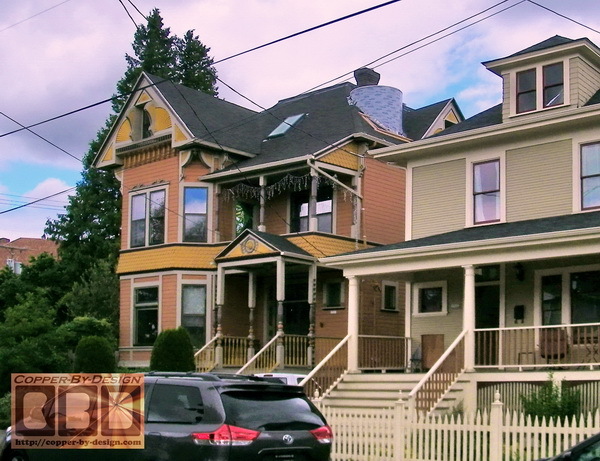 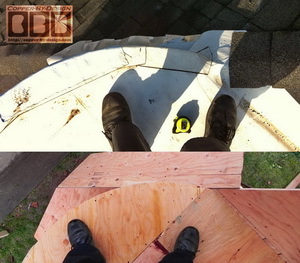 It is very tedious work at an average of 40 shingles a day, but I watched 4 seasons of Dexter to help pass the time. 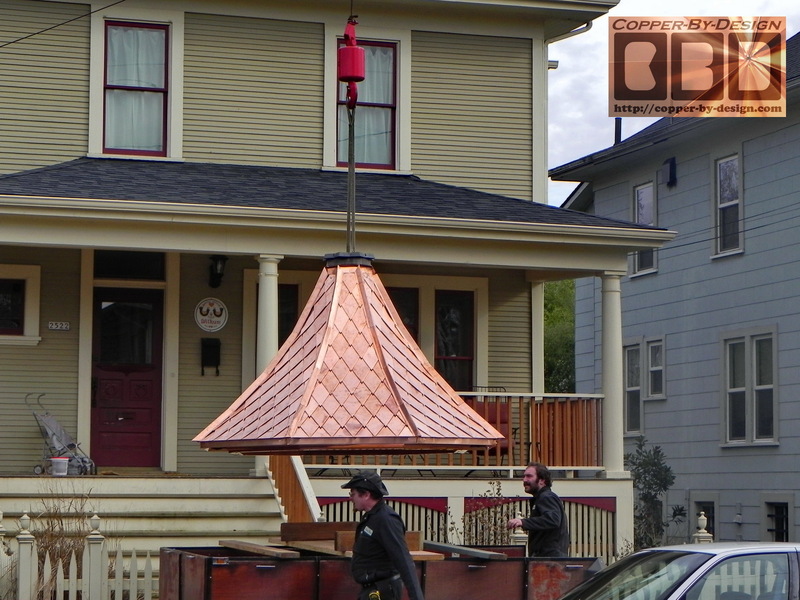 Thank goodness for On Demand. 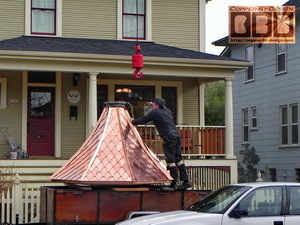 I got this much covered Saturday before the clients came over that evening for my B-Day party, and were able to see it in person. 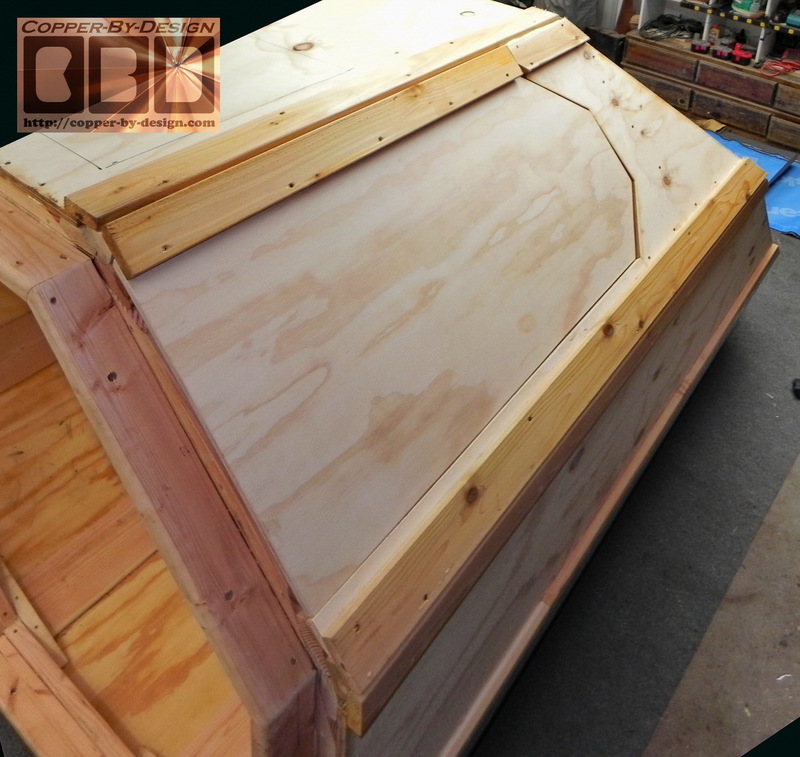 Helen was very excited to see my progress and show it off to a few of her friends at the party that night. 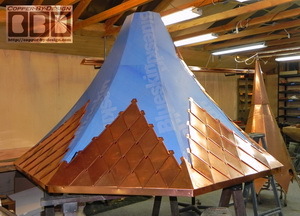 I needed to determine the best size for these diamond shaped shingles. The pattern I felt looked right was 6" X 12" for an exposure of 5" X 10.75". I was surprised to see how much this all added up to be, and did what I could to pare it down to make it more reasonable priced; taking my part of maybe getting so carried away with this project to add more style than the clients had asked for. 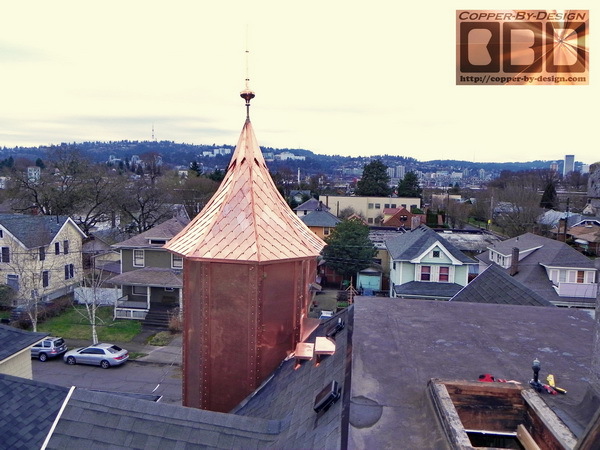 It has been an amazing experience seeing it come together and these clients were very easy to get along with. 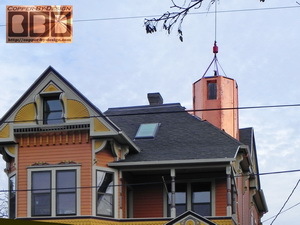 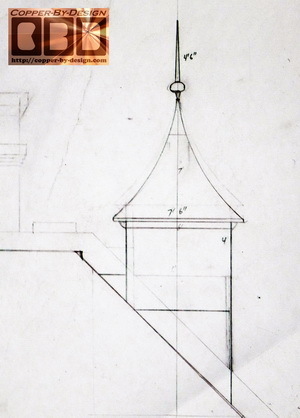 The lighthouse shaped chimney cap I made a year and a half back was the last time I got this thrilled with a project. It made me very nervous the thought of getting these to their house, and then getting them up to their roof without any damage after all this hard work to create this project. I worked on the ridge caps and the roof peak cap that will hold the finial. 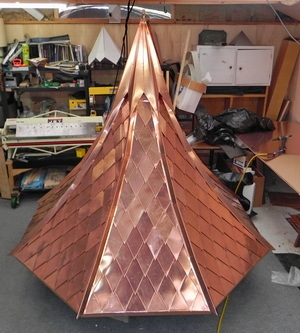 I design this unlike any I had done before, but it seemed fitting for this roof. I was quite pleased with the dramatic look this gave the turret. We moved the column section to the job site the day before covered in a tarp left at the curb. 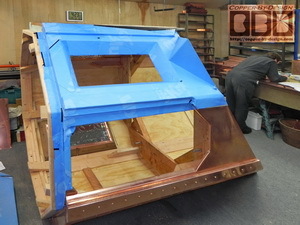 I worked in my shop until 11PM than night getting things ready. The next day I got up at 5AM to get the roof section finished up and loaded up on my other trailer to get it to the job site by Noon. The Gary Fulton of Fulton Crane arrived there at 1:30PM, so we had just enough time to get things set up and remove some shingles for the cricket on the North side of the turret. Here is a pair of videos shot by my 11 year old Son Torrin with my Nikon P100 camera set on a tripod, so it is not shaky, like most of my other vids, but it was a bit off level. 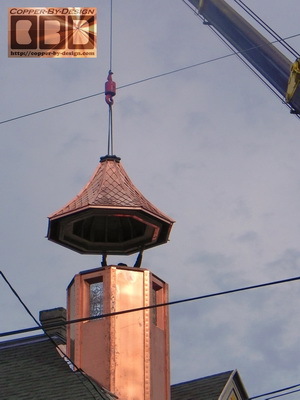 They show the column of the turret and the roof section I built being lifted up by Fulton Crane (503) 233-1672. 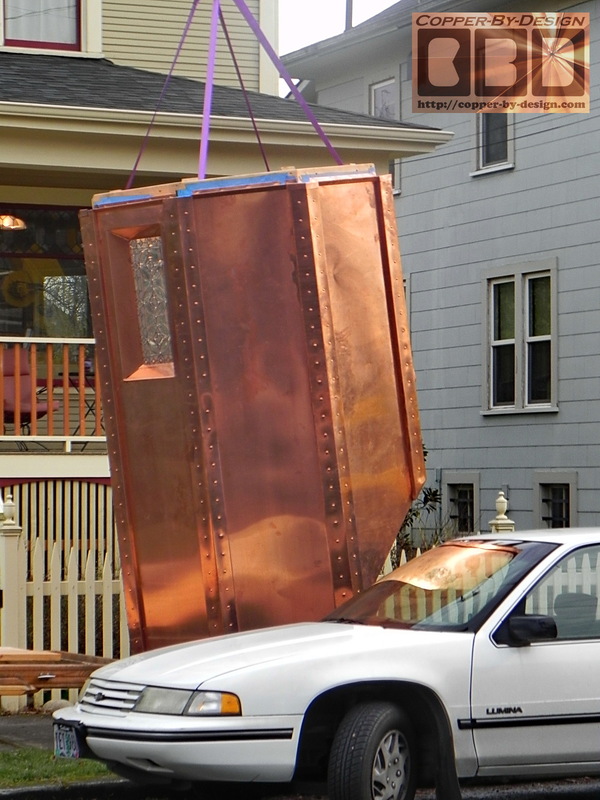 This lift went pretty smoothly and only took just over an hour and cost just $250. 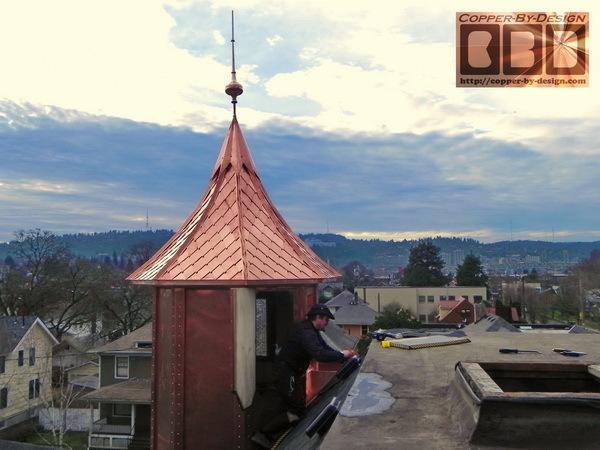 Here is a few still shots I got as we got this 2 part turret installed and all fastened down and the roof cap installed w/Morgana style finial. 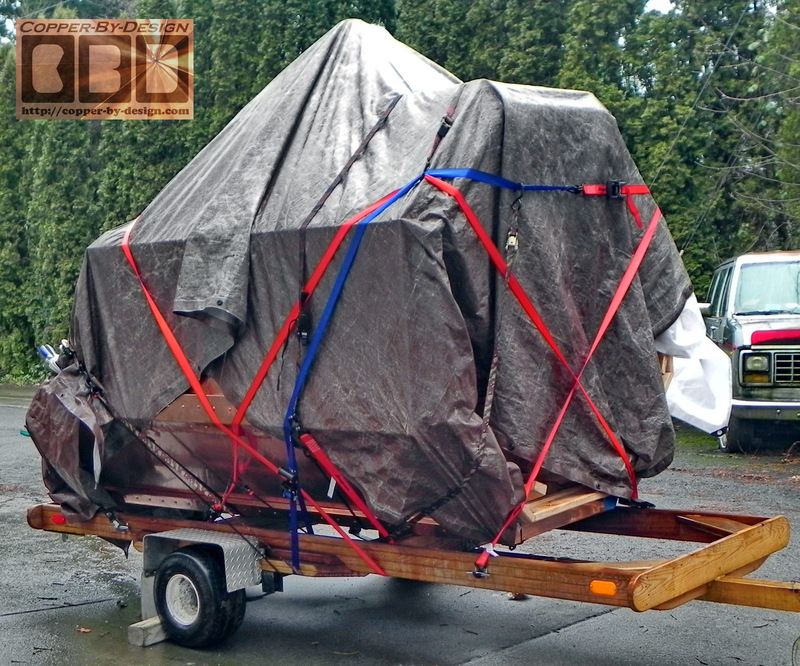 The transportation of the turret column made me very nervous as it was near the maximum weight limits of my light weight trailer that rode rather top heavy. We tilted the tongue up to aid in the lift. 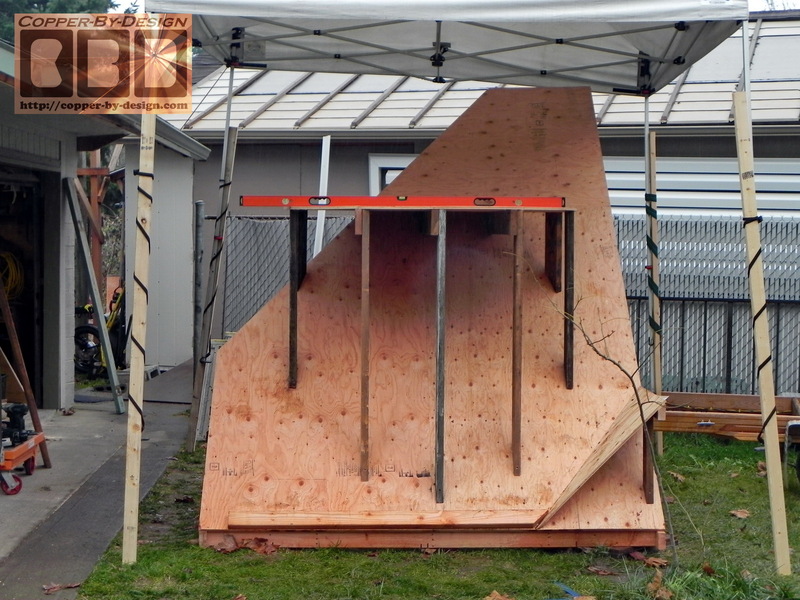 I felt pretty confident we were properly lifting this 800# structure. 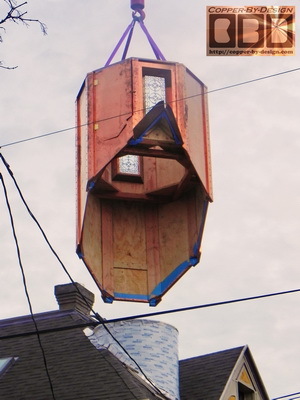 but I still cringe thinking of it dropping to the ground and getting smashed up. The crane operator: Gary has been very impressed with how smoothly our lifts go and loves seeing what sort of interesting projects we come up with. I had to quickly go up 3 flights of stairs and up a ladder through the access hatch on the roof to get up there to help guide it in place from inside. 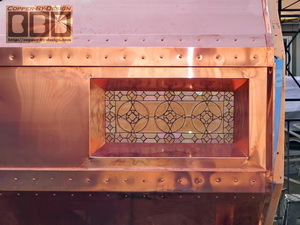 After it was set in place I realized I was locked inside, but I was able to lean over the side to reach the brass latch holding the door closed. 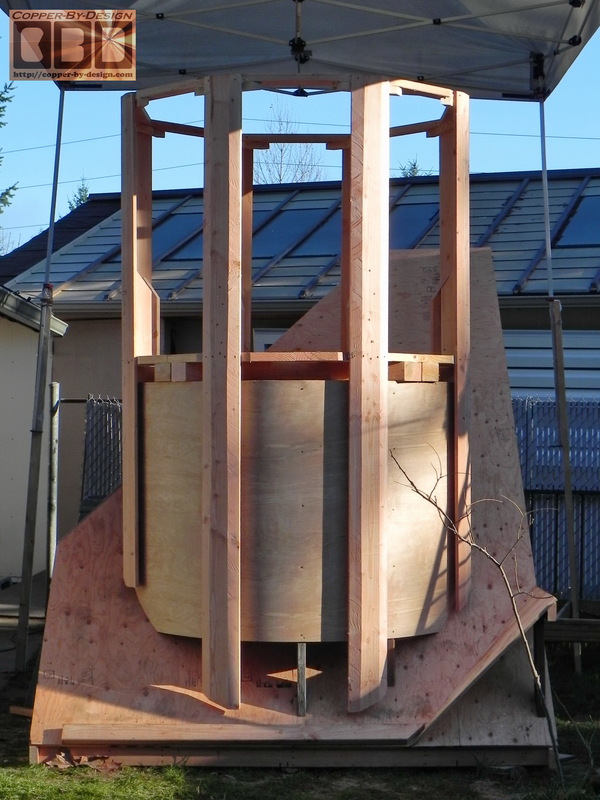 We had a little trouble with one of the crane stabilizers kept sinking deeper in the ground and we had to add more blocks of wood. 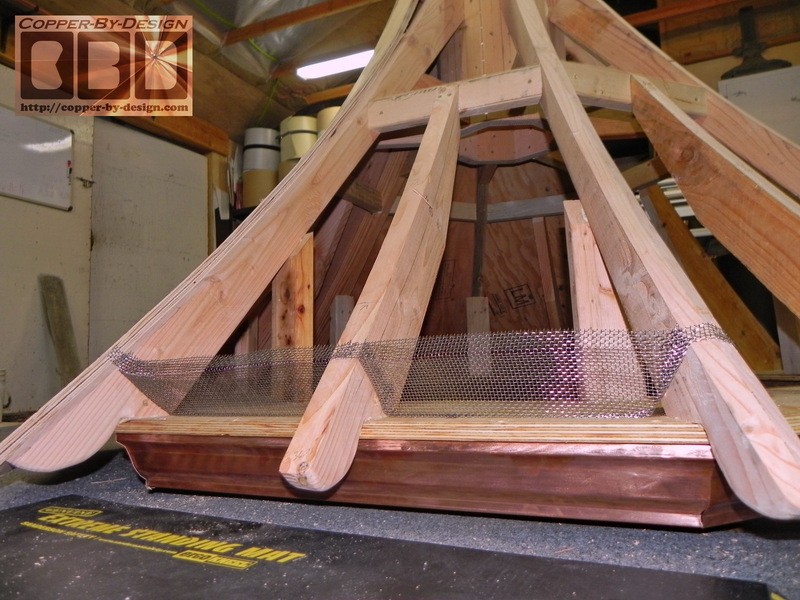 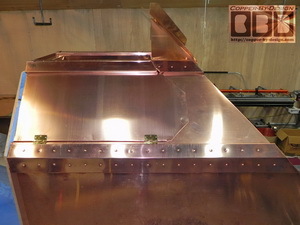 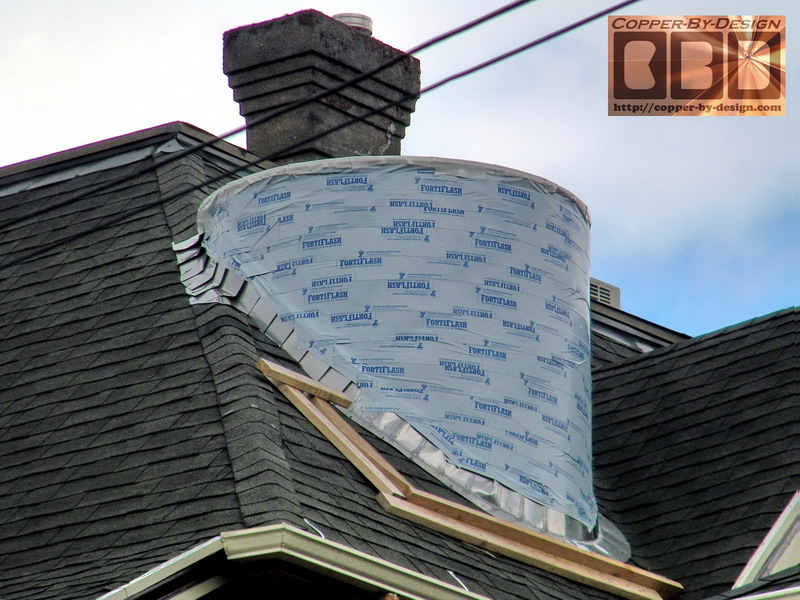 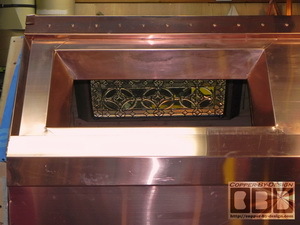 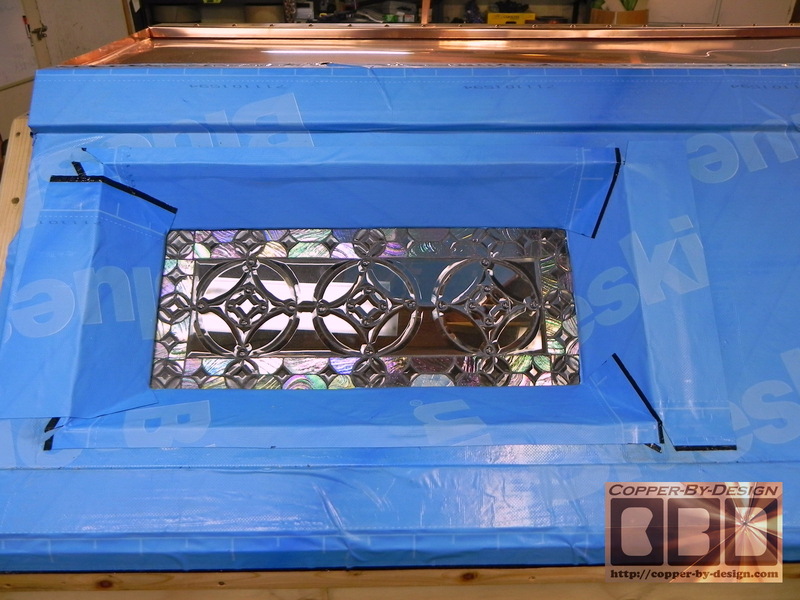 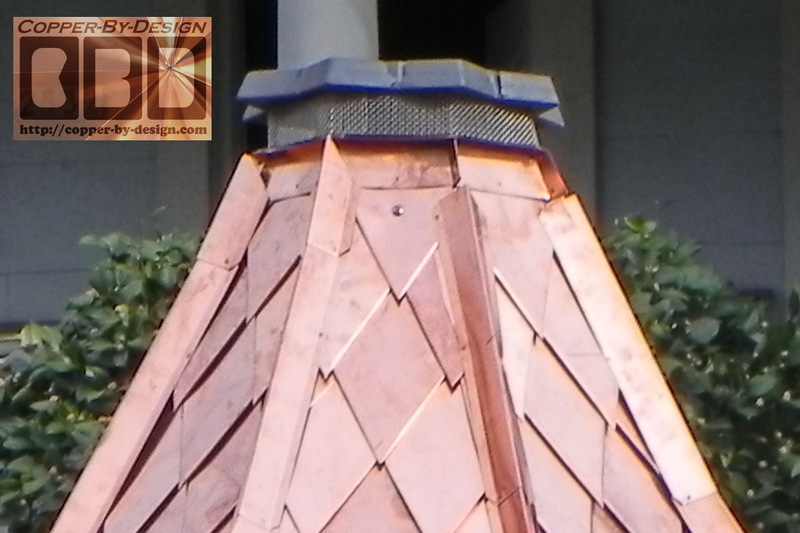 The image below shows a close up of the upper screened vent that will be covered by the top cap. I had made this very custom angle cut wood saddle made of 3 layers of 3/4" plywood and painted dark brown. 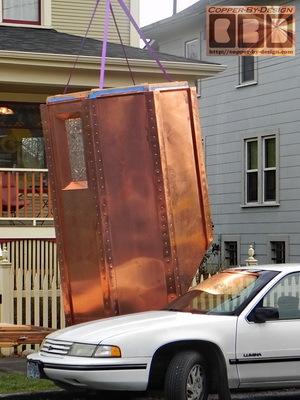 I felt this was quite clever, but one of those un sung triumphs that will never be seen. Then, before I could have a chance to fasten it down I needed to rush back to the ground to do the roof top lift while the crane operator waited. 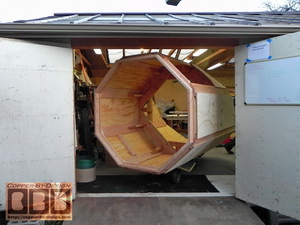 Chris got inside the trailer to hook the straps to the lift brace inside the roof after I fed them down through the 4" hole in the roof cap mount saddle/vent. Then, rush back up to guide the roof in place. 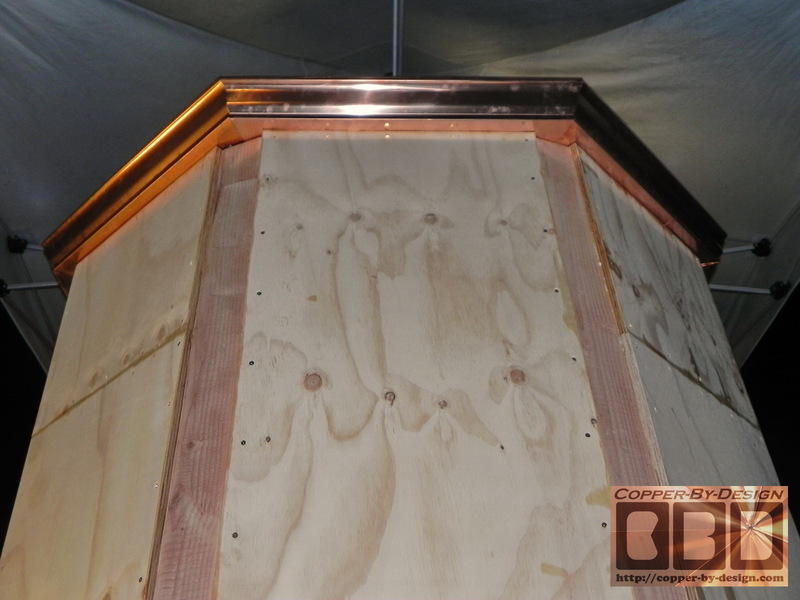 You can see some daylight coming down through the 4" hole in the top, but the venting will be just below that hole through the stainless steel screen and under the bottom edges of the roof peak cap. 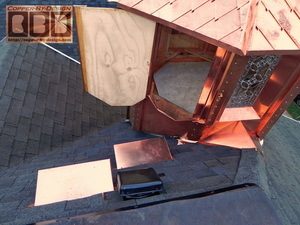 I had to put the shingles back in place around the cricket to seal this to the roof. 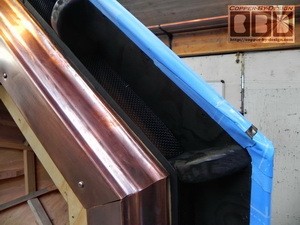 I had to come back that Saturday on the 11th to fasten down the copper covered steps I mounted on the roof and remove the tow boards the other contractors left on the roof just below the elevator shaft. I also had to patch the holes in the shingles those screws left.